本发明涉及一种多层压敏粘合剂（PSA）膜，其具有第一压敏粘合剂层和至少一个相对层，其中所述第一压敏粘合剂层包含具有基于(甲基)丙烯酸的弹性体材料的压敏粘合剂组合物，所述弹性体材料包含可聚合材料的反应产物，所述可聚合材料包含：（a）第一单体，其为伯醇R1-OH的(甲基)丙烯酸烷基酯，所述(甲基)丙烯酸烷基酯具有式（I）：CH2=C(R2)-(CO)-OR1(I)其中R1为具有14至25个碳原子的烷基，并且伯醇R1-OH具有等于至少2但不大于4的iso指数；R2为氢或甲基；和（b）第二单体，其具有烯键式不饱和基团；其中所述至少一个相对层包含至少一种填充材料。 The present invention relates to a multilayer pressure-sensitive adhesive (PSA) film, having a first pressure sensitive adhesive layer and at least one opposing layer, wherein the first pressure sensitive adhesive layer including the (meth ) pressure sensitive adhesive composition of the acrylic elastomeric material, said elastomeric material comprising the reaction product of a polymerizable material, a polymerizable material comprising: (a) a first monomer, which is a primary alcohol R1-OH the (meth) acrylate, a (meth) acrylic acid alkyl ester having the formula (I): CH2 = C (R2) - (CO) -OR1 (I) wherein R1 is having from 14 to 25 carbon alkyl atoms, and the alcohol R1-OH having primary iso index equal to at least 2 but not more than 4; R2 is hydrogen or methyl; and (b) a second monomer having an ethylenically unsaturated group; wherein the at least one opposing layer comprises at least one filler material. 本发明还涉及用于制造此类多层PSA膜的方法及其用途。 The present invention further relates to a method and its use for the manufacture of such multilayer PSA film. 本专利申请要求于2011年9月26日提交的欧洲专利申请号11182784. 6的优先权，所述文献的公开内容全文以引用方式并入本文。  This patent application claims priority to European Patent Application No. 26 September 2011 11182784.6 filed, the disclosure of said document is incorporated herein by reference in entirety. 本发明涉及多层压敏粘合剂（PSA)膜，其具有第一压敏粘合剂层和至少一个相对层。  The present invention relates to multilayer pressure-sensitive adhesive (PSA) film, having a first pressure sensitive adhesive layer and at least one opposing layer. 本发明还提供制备此类多层PSA膜的方法。 The present invention also provides a method of making such multilayer PSA film. 压敏粘合剂为具有例如下列具体特性的粘合剂：强力而持久的粘性，在不超过指压的情况下的附着性，足以保持在粘附体上的能力，以及足以从粘附体上干净地移除的内聚强度。  The pressure-sensitive adhesive having a pressure-sensitive adhesive, for example, the following specific characteristics: strong and permanent tack, adherence in the case where no more than finger pressure, and sufficient ability to hold onto an adherend, and sufficient from cleanly removable from the adherend cohesive strength. 随着近年来压敏粘合剂的应用大量增加，性能要求已变得更苛刻。 Applications with a significant increase in recent years, pressure sensitive adhesives, performance requirements have become more demanding. 虽然压敏粘合剂中已包括多种天然和合成的弹性体材料，但是基于（甲基）丙烯酸的弹性体材料由于多种有益性能而被广泛使用。  Although already included in the pressure-sensitive adhesive various natural and synthetic elastomeric material, the elastomeric material based on (meth) acrylic acid, a variety of beneficial properties are widely used. 除了提供期望的粘附和内聚程度之外， 常常可定制基于（甲基）丙烯酸的弹性体材料以提供其它期望的特性诸如弹性、粘着性、透明性、耐光和耐氧化性等。 In addition to providing a desired degree of adhesion and cohesion, are often customizable features such as flexibility, adhesion, transparency, light fastness and oxidation resistance and the like material-based elastomer (meth) acrylic acid to provide other desirable. 基于（甲基）丙烯酸的弹性体材料已描述于例如以下专利文献中：欧洲专利申请2072594A1 (Kondou 等人）、美国专利5, 648, 425 (Everaerts 等人)、美国专利6, 777, 079B2 (Zhou等人)、以及美国专利申请2011/04486A1 (Ma等人)。  Based on the elastomeric material (meth) acrylic acid, for example, have been described in the following patent documents: European Patent Application 2072594A1 (Kondou et al. ), U.S. Patent No. 5, 648, 425 (Everaerts et al. ), U.S. Patent No. 6, 777 , 079B2 (Zhou et al. ), and US Patent application 2011 / 04486A1 (Ma et al.). 包括多个叠加层的压敏粘合剂带材由US4, 818, 610 (Zimmerman等人）中已知，其中至少一个外层为压敏粘合剂层。  The pressure-sensitive adhesive tape comprising a plurality of superimposed layers by US4, 818, 610 (Zimmerman et al.) Is known, wherein the at least one outer layer is a pressure sensitive adhesive layer. 所述压敏粘合剂层可得自包含丙烯酸酯的可聚合混合物。 The pressure sensitive adhesive layer comprises an acrylate can be obtained from a polymerizable mixture. 不质疑与本领域已知的压敏粘合剂相关的技术优点，仍然需要多层PSA膜，其具有改善的粘附特性，具体地讲相对于剥离力和抗剪切性。  The question is not known in the art of pressure sensitive adhesive associated technical advantages is still required multilayer PSA film having improved adhesion characteristics, particularly with respect to the peel strength and shear resistance. 由现有技术已知的压敏材料常常不对所谓的LSE基底，即具有低表面能的基底如聚烯烃表面或清漆涂层表面，具体地讲用于车辆如汽车的清漆涂层提供足够的粘性。  from the prior art known pressure-sensitive material is often not called LSE substrates, i.e. substrates having a low surface energy polyolefin surfaces or surface coatings such as varnish, in particular a vehicle such as an automobile for the clearcoat to provide sufficient adhesion. 特别地，这些难以粘结的基底上的抗剥离力常常不满足要求，具体地讲在环境胁迫如改变温度和湿度的情况下。 In particular, these anti-peel force on difficult to bond substrates often does not meet the requirements, in particular in the case of environmental stress, such as temperature and humidity changes. 这种不足可通过添加较高含量的增粘剂而部分地克服。 This deficiency can be partially overcome by adding higher levels of tackifier. 然而，过量使用增粘剂常常伴随抗剪切性由于增粘剂的增塑效应而降低的缺点。 However, excessive use of tackifier often accompanied by drawbacks due to the shear resistance of the plasticizing effect and reduced thickener. 并且，增粘剂可迀移到其上粘结粘合带的基底中，并可导致不可取的变色或降低的稳定性。 Further, the tackifier may be moved to its substrate Gan adhesive tape on the adhesive, and may cause discoloration or reduced stability undesirable. 经增粘的包含常规基于（甲基）丙烯酸的弹性体材料的压敏粘合剂的另一个问题在于这些制剂可出现混浊，展示常规基于（甲基）丙烯酸的弹性体材料的特性透明性的损失。  comprise conventional tackified another problem that the pressure-sensitive adhesives based on elastomeric material (meth) acrylic acid such formulations may appear cloudy, showing a conventional material-based elastomer (meth) acrylate, a characteristic loss of transparency. 浑浊为增粘剂和弹性体材料的有限的相容性或不完全的相容性的指示。 Turbidity tackifier and limited compatibility elastomeric material or incomplete indication of compatibility. 降低的相容性可导致老化时粘合性能的劣化，如由粘性的损失或降低的剥离粘附性所证实。 Reduced compatibility can lead to deterioration in adhesive performance upon aging, as evidenced by a decrease or loss of tack peel adhesion. 因此，本发明的目的是提供上述类型的多层PSA膜，其将LSE (低表面能）基底上的良好剥离力和高抗剪切性结合而不必使用过量增粘剂。  Accordingly, an object of the present invention is to provide a multilayer PSA film of the type described above, which the LSE (low surface energy) on the substrate good peel strength and high shear through the binding without the use of tackifiers. 该目的通过根据本发明的多层压敏粘合剂（PSA)膜来解决。 This object is solved by (PSA) film multilayer pressure-sensitive adhesive of the present invention. 其中所述至少一个相对层包含至少一种填充材料。  wherein the at least one opposing layer comprises at least one filler material. 实际上已令人惊奇地发现如上所述的多层PSA膜，将对LSE基底的高剥离力与高抗剪切力相结合。  In practice it has been surprisingly found that a multilayer PSA film described above, will combine high release force LSE substrates with high shear resistance. 因此，本发明的多层PSA膜尤其适用于被粘结到低能量表面诸如聚烯烃表面和清漆涂层表面。  Thus, the multilayer PSA film of the present invention is particularly adapted to be bonded to a low energy surface and a polyolefin surface such as a varnish coating surface. 本发明的多层PSA膜优选适用于被粘结到车辆如汽车的清漆涂层表面。 PSA multilayer film of the present invention is adapted to be bonded to the surface of the clearcoat of a vehicle such as an automobile. 在另一方面，本发明涉及制造如上所述的多层压敏粘合剂膜的方法，从而使第一压敏粘合剂层和相对层叠加在彼此上。  In another aspect, the present invention relates to a method of producing a multilayer pressure sensitive adhesive film as described above, so that the first pressure sensitive adhesive layer and the opposite layer over each other. 在另一方面，本发明涉及如上所述的多层压敏粘合剂膜的用途，其作为PSA膜用其第一压敏粘合剂层粘结到LSE基底表面，优选地清漆涂层表面。  In another aspect, the present invention relates to the use of a multilayer pressure sensitive adhesive film described above, which is bonded with a first pressure sensitive adhesive layer to the substrate surface as LSE PSA film, preferably a varnish the coating surface. 根据本发明，用于多层PSA膜的压敏粘合剂包含使用可聚合材料制备的基于（甲基）丙烯酸的弹性体材料，所述可聚合材料包括（a)(甲基）丙烯酸烷基酯，其具有支化的并且包含至少14个碳原子的烷基，以及（b)至少一种其它烯键式不饱和单体。  According to the present invention, the pressure-sensitive adhesive film comprising a multilayer PSA based on (meth) acrylic elastomeric materials prepared using the polymerizable material, the polymeric material may comprise (a) (meth) alkyl acrylates having a branched alkyl group and containing at least 14 carbon atoms, and (b) at least one other ethylenically unsaturated monomer. 如本文所用，术语"（甲基）丙烯酸烷基酯"（"alkyl(meth)a Crylate"）以及"（甲基）丙烯酸烷基酯"（111^1(111的11)&(^ 71&仏65^^"）互换使用。术语"（甲基）丙烯酸酯"指丙烯酸酯、甲基丙烯酸酯、或上述两者；术语"（甲基）丙烯酸"是指甲基丙烯酸、丙烯酸、或上述两者。"基于（甲基）丙烯酸"的材料是指由具有（甲基）丙烯酰基的一个或多个单体制得的材料，所述（甲基）丙烯酰基为具有下式的基团：CH2=C(R2)-(C0)-，其中R 2为氢或甲基。  As used herein, the term "(meth) acrylic acid alkyl ester" ( "alkyl (meth) a Crylate"), and "(meth) acrylic acid alkyl ester" 11 (111 ^ 1 (111) & ( ^ ^ 65 ^ 71 & Fo. ") used interchangeably with the term" (meth) acrylate "means acrylate, methacrylate, or both, above; the term" (meth) acrylic acid "refers to methacrylic acid, , or both. materials "on (meth) acrylic acid" refers to a material having a (meth) acryloyl groups have one or more monomers of the (meth) acryloyl group having the formula group: CH2 = C (R2) - (C0) -, wherein R 2 is hydrogen or methyl. 已知的压敏粘合剂中所包括的基于（甲基）丙烯酸的弹性体材料常常由具有相对低玻璃化转变温度（Tg)(即，单体的Tg按照由单体制备的均聚物所测量）的一种或多种非极性丙烯酸酯单体加上各种任选的单体如一种或多种极性单体来制备。  The known pressure-sensitive adhesives are based on an elastomeric material comprising a (meth) acrylic acid, often having a relatively low glass transition temperature of (a Tg of) (i.e., Tg monomers prepared from monomers according to the one or more polar monomers to prepare homopolymers measured) one or more non-polar acrylate monomers with a variety of optional monomers. 常常将极性单体选择成具有酸性基团、羟基、或含氮基团。 Often selected to polar monomers having an acidic group, a hydroxyl group, or a nitrogen-containing group. -些广泛用于常规基于（甲基）丙烯酸的弹性材料中的非极性丙烯酸酯单体为(甲基）丙烯酸烷基酯诸如丙烯酸2-乙基己酯（EHA)和丙烯酸异辛酯（Ι0Α)。  - those based on the elastic material is widely used in the conventional (meth) acrylic acid in a non-polar acrylate monomers are (meth) acrylic acid alkyl esters such as 2-ethylhexyl acrylate (EHA) acrylate and octyl (Ι0Α). 这两种丙烯酸烷基酯均具有含八个碳原子的烷基（即，单体为丙烯酸Cs烷基酯)。 Both alkyl acrylates each having an alkyl group containing eight carbon atoms (i.e., Cs alkyl ester of acrylic acid monomer). 具有多于八个碳原子或少于八个碳原子的烷基的（甲基）丙烯酸烷基酯可具有在压敏粘合剂性能方面的许多缺点。 (Meth) acrylic acid alkyl ester having an alkyl group of more than eight carbon atoms or less than eight carbon atoms may have a number of disadvantages in terms of the pressure sensitive adhesive properties. 例如，具有较短烷基链的（甲基）丙烯酸烷基酯(例如丙烯酸丁酯，其为丙烯酸C4烷基酯)，趋于使弹性体材料的Tg和储能模量两者均显著增加。 For example, (meth) acrylic acid alkyl esters with shorter alkyl chains (e.g., butyl acrylate, acrylic acid which is a C4 alkyl ester), the elastomeric material tending to Tg and storage modulus increased significantly both . 室温储能模量可增加至高于压敏粘合剂的可用范围(例如，约3X106达因/cm2)。 Room temperature storage modulus of the pressure-sensitive adhesive may be increased to above the usable range (e.g., from about 3X106 dynes / cm2). 即，所得的弹性体材料可具有不足以被看成是压敏粘合剂的粘着性。 That is, the resulting elastomer material may be viewed as having insufficient tack pressure sensitive adhesive. 作为另外一种选择，具有较长烷基链如较长直链烷基链的（甲基）丙烯酸烷基酯(例如，丙烯酸正十八烷基酯，其为丙烯酸C1S烷基酯）可导致聚合物内的结晶基团。 Alternatively, having longer alkyl chain (meth) acrylic acid alkyl esters, such as long-chain linear alkyl (e.g., acrylic acid n-octadecyl ester as C1S alkyl ester acrylate) may lead to groups within the crystalline polymer. 这些结晶基团的存在可显著降低弹性材料的粘着性。 The presence of these crystals groups can significantly reduce the tackiness of the elastomeric material. f-OH具有在2至4范围内的iso指数。  f-OH with iso index in the range of 2 to 4. 基团R2为氢或甲基。 The group R2 is hydrogen or methyl. 在很多实施例中， R2为氢（即式（I)的单体为丙烯酸烷基酯)。 In many embodiments, R2 is hydrogen (i.e., formula (I) is an alkyl acrylate monomer). 在式（I)中，基团R1为具有14至25个碳原子的支化的烷基。  In the formula (I), the group R1 is a branched alkyl group having 14 to 25 carbon atoms. 用于形成（甲基） 丙烯酸烷基酯的伯醇f-OH常常使用羰基合成法制备。 For forming the (meth) acrylic acid alkyl ester is a primary alcohol is often used f-OH Preparation oxo. 羰基合成法基于通过乙烯、丙烯、丁烯等低聚而制成的烯烃的加氢甲酰化。 Oxo process based on hydrogenation of olefins produced by ethylene, propylene, butene oligomerization formylation. 使用该方法制备的醇通常为具有多个支化位置的支化的伯醇。 Alcohol is usually prepared by the method of branched primary alcohol having a branched plurality of positions. 在基团R1的每个碳原子支化点处，存在附接的乙基或甲基。 At each point of the radicals R1 branched carbon atoms, the presence of ethyl or methyl attached. 换句话讲，当一级链支化成两个二级链时，所述二级链中至少一个为甲基或乙基。 In other words, when a two-chain branched into two chains, at least one of the two chains is methyl or ethyl. 二级链之一进一步支化成两个三级链并且所述三级链中至少一个为甲基或乙基。 One two-chain branched into two further three chains of the three chains and at least one is methyl or ethyl. 同样，如果任何三级链进一步支化成两个四级链，则四级链中至少一个为甲基或乙基。 Similarly, if any of three further chain branched into two four chains, at least one of the four chains is methyl or ethyl. 在一些实施例中，大部分(例如，至少50%， 至少60%，至少70%，至少80%，或至少90%)的碳原子支化点具有附接的乙基。 In some embodiments, a majority (e.g., at least 50%, at least 60%, at least 70%, at least 80%, or at least 90%) having a carbon atom branch point attachment ethyl. 合适的羰基合成醇（即，使用羰基合成法制备的醇）可商购获得或可使用例如描述于PCT专利申请公布W02009/124979A1 (Rudolph等人)中的方法所制备。  Suitable oxo alcohols (i.e., prepared using the oxo alcohol) are commercially available or may be used, for example as described in PCT Patent Application Publication preparation method of W02009 / 124979A1 (Rudolph et al.). 可使用如描述于例如美国专利申请公布2011/0130582 (Bette等人）中的那些方法，通过与（甲基）丙烯酸反应而将这些羰基合成醇转化成（甲基）丙烯酸烷基酯。 The method may be used such as those described in, for example, U.S. Patent Application Publication 2011/0130582 (Bette et al. ), By reaction with (meth) acrylate, and these oxo alcohols converted to (meth) acrylate. 一些由羰基合成醇制备的（甲基）丙烯酸烷基酯如具有C17烷基的（甲基）丙烯酸烷基酯可从巴斯夫公司（BASF)(德国的路德维希港（LudwigshafenjE))商购获得。 (Meth) acrylate of some (meth) acrylic acid alkyl esters prepared by the oxo alcohols having C17 alkyl group, such as commercially available from BASF (BASF) (Ludwigshafen, Germany (LudwigshafenjE)) obtain. 这些（甲基）丙烯酸C17烷基酯常常为结构异构体的混合物。 These (meth) acrylic acid alkyl ester is often a mixture of C17 structural isomers. 支化度（即，iso指数)定义成伯醇f-OH中的甲基（_CH3)数减1。  The degree of branching (i.e., iso index) is defined as the primary alcohol in methyl f-OH (_CH3) minus one. 在整个本发明说明书中，术语"iso指数"和"iso数"可互换使用。 Throughout the present specification, the term "iso index" and "ISO number" are used interchangeably. 平均(平均）支化度为存在于样品中的所有伯醇f-OH的所有不同支化度的平均值。 Average (mean) degree of branching present in the sample of all primary alcohol f-OH average of all the different degrees of branching. 平均支化度可使用醇或醇混合物的1Η核磁共振光谱分析来确定。 The average degree of branching may be used alcohol or alcohol mixture 1Η NMR spectroscopy determined. 更具体地，使样品中的每个醇与异氰酸三氯乙酰酯反应以形成氨基甲酸酯。 More specifically, each of the sample in alcohol with trichloroacetyl isocyanate to form a carbamate ester. 平均支化度使用公式1计算。 The average degree of branching is calculated using Equation 1. 在公式1中，术语I(CH3)是指对应于甲基质子的总积分峰面积（δ在0.70至0.95ppm的范围内）并且术语I(CH2-0R)是指衍生化伯醇中亚甲基质子的总积分峰面积（δ 为3. 9至4.5)。  In Equation 1, the term I (CH3) refers to methylene protons corresponding to total integrated peak area ([delta] in the range of 0.70 to 0.95ppm) term and I (CH2-0R) refers to a derivatized primary alcohol the total integrated peak area of ​​the methylene protons ([delta] is from 3.9 to 4.5). 术语R是指氨基甲酸酯减去- OR1基团的残留物。 The term refers to a carbamate by subtracting R - residue OR1 groups. iso指数通常在2至4的范围内。  iso index is generally in the range of 2 to 4. 在一些实施例中，iso指数为至少2. 2、至少2. 4、 至少2. 6、至少2. 8或至少3。 In some embodiments, ISO index of at least 2.2, at least 2.4, at least 2.6, at least 2.8, or at least 3. iso指数可以为至多3. 8、至多3. 6、至多3. 4、至多3. 2、或至多3。 iso index may be at most 3.8, at most 3.6, at most 3.4, at most 3.2, or at most 3. 例如，所述iso指数可以在2. 2至4、2. 2至3. 8、2. 4至4、2. 4至3. 8、2. 6至4、2. 6至3. 8、2. 8 至4、2. 8 至3. 8、2. 8 至3. 6、或2. 8 至3. 4 的范围内。 For example, the index may be iso 2.2 to 4,2. 2 to 3. 8,2. 4,2. 4 to 4 to 3. 8,2. 6 to 4,2. 6 to 3.8, 2.8 to 4,2. 8 to 3. 8,2. 8 to 3.6, or the range of 2.8 to 3.4. 多个第一单体可用于形成基于（甲基）丙烯酸的弹性体材料。  The first monomer may be a plurality of elastomeric material used to form the (meth) acrylic acid based. 换句话讲，第一单体可以为具有不同烷基的（甲基）丙烯酸烷基酯的混合物。 In other words, the first monomer may be a mixture of esters of (meth) acrylic acid alkyl having different alkyl groups. 烷基（即，式（I)中的基团R1) 可在碳原子数方面不同，可以为结构异构体或上述两者。 (I.e., the radicals R1 in formula (I)) may be different alkyl carbon number aspects, or both the above-described structural isomers. 每个烷基具有14至25个碳原子。 Each alkyl having from 14 to 25 carbon atoms. 例如，碳原子数可以在17至25、17至21、14至21、或14至17的范围内。 For example, to 21 carbon atoms which may, or in the range of 14 to 17 at 17 to 25,17 to 21,14. 在一些实施例中，多个式（I)的第一单体可由多个为结构异构体的伯醇f-OH来制备。  In some embodiments, a first plurality of monomers of formula (I) may be a primary alcohol structural isomers f-OH was prepared as a plurality. 在一些实施例中，至少50重量％、至少60重量％、至少70重量％、至少80重量％、至少90重量％、至少95重量％、至少97重量％、至少98重量％、至少99重量％或至少99. 5重量％的伯醇为结构异构体。 In some embodiments, at least 50%, at least 60%, at least 70%, at least 80%, at least 90%, at least 95%, at least 97%, at least 98%, at least 99 wt% or at least 99.5% by weight of a primary alcohol to structural isomers. 在一些实施例中，结构异构体具有含17个碳原子、21个碳原子、 或25个碳原子的基团R1。 In some embodiments, structural isomers with 17 carbon atoms, 21 carbon atoms, or 25 carbon atoms in the groups R1. 每个结构异构体均可以任何合适的量存在。  Each structural isomers can be present in any suitable amount. 在结构异构体的一些实施例中，多个式（I)的不同单体主要可以为单一单体。 In some embodiments, the structural isomer, a plurality of different monomers of formula (I) may be a single main monomer. 例如，至少50重量％、至少60重量％、至少70重量％、至少90重量％、至少95重量％或至少98重量％的第一单体可以为特定结构异构体。 For example, at least 50%, at least 60%, at least 70%, at least 90%, at least 95% or at least 98% by weight of the first monomer may be a specific structure isomer. 在其它实施例中，多个第一单体可以由具有不同碳原子数的烷基的多个伯醇f-OH制备。 , a plurality of first monomers can be prepared from a plurality of primary alkyl alcohol having different numbers of carbon atoms of f-OH in other embodiments. 更具体地，烷基具有14至25个碳原子。 More specifically, an alkyl group having from 14 to 25 carbon atoms. 例如，不同的烷基可具有17至25个、 17至21个、14至21个、或14至17个碳原子。 For example, different groups may have 17-25, 17-21, 14-21, or 14 to 17 carbon atoms. 每个第一单体可以任何量存在。 Each of the first monomer may be present in any amount. 在一些实施例中，多个式（I)的不同单体主要可以为单一单体。 In some embodiments, a plurality of different monomers of formula (I) may be a single main monomer. 例如，至少50重量％、至少60重量％、 至少70重量％、至少90重量％、至少95重量％或至少98重量％的第一单体可以为特定单体。 For example, at least 50% by weight, at least 60%, at least 70%, at least 90%, at least 95% or at least 98% by weight of the first monomer may be a particular monomer. 使用式（I)的第一单体作为唯一的可聚合材料而制备的聚合物材料(例如，由第一单体形成的均聚物）趋于具有低结晶温度（Tc)。  The polymeric material of the first monomers of formula (I) as the sole polymeric material may be prepared (e.g., formed from a first monomer homopolymer) tends to have a low crystallization temperature (Tc). 结晶温度常常小于-80°C、小于_85°C、小于-90°C、或小于_95°C。 The crystallization temperature is often less than -80 ° C, of ​​less than _85 ° C, of ​​less than -90 ° C, or less than _95 ° C. 据信，烷基R1中存在的多个支化点有助于该低结晶温度。 It is believed that the presence of a plurality of R1 is an alkyl group of branch points contribute to the low crystallization temperature. 具有直链而不是支化的长链烷基的常规（甲基）丙烯酸烷基酯常常具有大得多的Tc。 A linear rather than branched conventional (meth) acrylic acid long chain alkyl ester group often has a much larger Tc. 例如，当使用差示扫描量热法（DSC)分析测量时，具有直链C12烷基的丙烯酸月桂酯具有-8°C的Tc。 For example, when using differential scanning calorimetry (DSC) analysis measurements, a straight-chain C12 alkyl group having a Tc of lauryl methacrylate having a -8 ° C. 较低的Tc通常是压敏粘合剂所期望的。 Tc is usually lower desired pressure sensitive adhesive. 仅通过使式（I)的第一单体聚合而制备的聚合材料(例如由第一单体形成的均聚物)趋于具有小于_40°C的玻璃化转变温度。 Prepared  polymerized only by making a first monomer of formula (I) is a polymeric material (e.g., a homopolymer formed from the first monomer) tends to have less than a glass transition temperature of _40 ° C. 例如，Tg小于-45°C、小于_50°C、小于_55°C、 小于-60°C、或小于_65°C。 E.g., Tg less than -45 ° C, of ​​less than _50 ° C, of ​​less than _55 ° C, of ​​less than -60 ° C, or less than _65 ° C. 对于制备可在宽温度范围内使用的弹性体材料而言，低Tg是有利的。 For the preparation of elastomeric material may be used in a wide temperature range, low Tg is advantageous. 低Tg还可有利于对基底的适形性并增加对更宽范围基底材料的粘附。 The low Tg may also facilitate conformity to the substrate and to increase the adhesion to a wider range of substrate materials. 可改变烷基R1中的碳原子数和支化度以优化弹性体材料的流变性。  carbon atoms can be changed and the degree of branching in the alkyl groups R1 to optimize the rheology of elastomeric material. 例如，随碳原子数增加，需要一些支化度(例如，较大的iso指数)以维持低Tc。 For example, with the number of carbon atoms increases, we need some degree of branching (e.g., greater iso index) to maintain a low Tc. 然而，如果iso指数太高， 则弹性体材料的Tg和储能模量将增加。 However, if the iso index is too high, then the Tg and storage modulus of the elastomeric material will increase. 如果Tg和储能模量增加太多，则压敏粘合剂的特性可能会受到影响。 If Tg and storage modulus increased too much, the pressure-sensitive adhesive properties may be affected. 式（I)的单体有利地具有比常规使用的具有心烷基的丙烯酸烷基酯单体更高的沸点。 Monomers  Formula (I) advantageously have a boiling point higher alkyl acrylate ester monomers having alkyl heart than conventionally used. 较高的沸点可导致与常规基于（甲基）丙烯酸的压敏粘合剂相比，具有更低总体挥发分含量和恶臭的压敏粘合剂的形成。 Higher boiling and can result in the formation malodorous content compared to pressure sensitive adhesives based on (meth) acrylic pressure sensitive adhesive of a conventional, generally have a lower volatile. 可使用任何适量的第一单体以形成基于（甲基）丙烯酸的共聚弹性体材料。  using any suitable amount of the first monomer to form a copolymer based elastomeric material (meth) acrylic acid. 在一些实施例中，用于形成弹性体材料的至少50重量％的可聚合材料为式（I)的第一单体。 At least 50% by weight of the polymerizable material, in some embodiments, the elastomeric material used to form the first monomer of formula (I) are. 例如，至少60重量％、至少65重量％、至少70重量％、至少75重量％、至少80重量％、至少85 重量％、至少90重量％、或至少95重量％的用于形成弹性体材料的可聚合材料可具有式（I)。 For example, at least 60%, at least 65%, at least 70%, at least 75%, at least 80%, at least 85%, at least 90 wt%, or at least 95% by weight of the elastomeric material used to form the The polymerizable material may have the formula (I). 在一些实施例中，以用于形成弹性体材料的可聚合材料的总重量计，式（I)的第一单体的存在量可以在50至99. 5重量％、50至99重量％、60至99重量％、60至95重量％、70至99重量％、70至95重量％、80至99重量％、或85至99重量％的范围内。 In some embodiments, the first monomer to the polymerizable material used to form the elastomeric material of the total weight of the formula (I) may be present in an amount of 50 to 99.5 wt%, 50 to 99 wt%, from 60 to 99 wt%, 60-95 wt%, 70-99 wt%, 70-95 wt%, 80-99 wt%, or from 85 to 99% by weight. 式（I)的（甲基）丙烯酸烷基酯单体的添加量通常可以大于其它在前所用的具有含至少10个碳原子的烷基的（甲基）丙烯酸烷基酯。  Formula (I) are (meth) acrylic acid alkyl ester monomer added can be generally larger than the other before use in having an alkyl group containing at least 10 carbon atoms (meth) acrylate. 当使用具有含至少10个碳原子的烷基的常规（甲基）丙烯酸烷基酯时，引发聚合材料结晶。 When using a conventional (meth) acrylic acid alkyl ester having an alkyl group containing at least 10 carbon atoms, a crystalline material to initiate the polymerization. 为抑制结晶，这些（甲基）丙烯酸烷基酯的量通常在所述可聚合材料的小于30重量％的范围内（例如，在所述可聚合材料的5至30重量％的范围内）。 The range of crystallization is suppressed, the (meth) acrylic acid alkyl ester is typically an amount of less than 30% by weight of the polymerizable material (e.g., in the range of 5 to 30% by weight of the polymerizable material). 用于本发明多层PSA膜的压敏粘合剂组合物中所包含的基于（甲基）丙烯酸的弹性体材料为由（a)式（I)的第一单体和（b)具有烯键式不饱和基团的第二单体所制备的共聚物。 The first monomer  The pressure-sensitive adhesive composition for the multilayer films of the present invention, the PSA contained in an elastomeric material based on (meth) acrylic acid by (a) of formula (I) and (b ) a second copolymer of a monomer having unsaturated groups of ethylenically prepared. 具有烯键式不饱和基团的任何合适的第二单体可与式（I)的第一单体联合使用以制备基于（甲基）丙烯酸的弹性体材料。 Any suitable second monomer having an ethylenically unsaturated group with a first monomer of formula (I) are used in combination in the preparation of an elastomeric material based on (meth) acrylic acid. 合适的第二单体包括但不限于不为式（I)的非极性(甲基）丙烯酸酯、各种其它非极性单体如各种不具有（甲基）丙烯酰基的非极性乙烯单体、各种极性单体、交联剂、或它们的组合。 Suitable second monomers include, but are not limited to, non-polar of formula (I), (meth) acrylate, various other non-polar monomers such as various having no (meth) acryloyl group nonpolar vinyl monomer, various polar monomers, crosslinkers, or combinations thereof. 除交联剂之外，第二单体通常具有单个烯键式不饱和基团。 In addition to the crosslinking agent, usually a second monomer having a single ethylenically unsaturated group. 不是式（I)的非极性（甲基）丙烯酸酯包括，例如具有含1至13个碳原子的烷基的（甲基）丙烯酸烷基酯、具有含至少14个碳原子但是iso指数小于2的烷基(例如直链的或具有单个支化点的烷基）的（甲基）丙烯酸烷基酯、（甲基）丙烯酸烯基酯、（甲基） 丙烯酸芳基酯、芳基取代的丙烯酸烷基酯、芳氧基取代的（甲基）丙烯酸烷基酯等。  The non-polar is not of formula (I) are (meth) acrylates include, for example, (meth) acrylic acid alkyl ester having an alkyl group having 1 to 13 carbon atoms, having at least 14 carbon atoms containing it iso index of less than 2 alkyl group (e.g. linear or branched alkyl group having a single point) of the (meth) acrylate, (meth) acrylate ester, (meth) acrylic acid aryl esters, aryl-substituted alkyl acrylates, aryloxy-substituted (meth) acrylate and the like. 具有含1至13个碳原子的烷基的（甲基）丙烯酸烷基酯包括但不限于，（甲基） 丙烯酸甲基酯、（甲基）丙烯酸乙基酯、（甲基）丙烯酸正丙基酯、（甲基）丙烯酸异丙基酯、（甲基）丙烯酸正丁基酯、（甲基）丙烯酸异丁基酯、（甲基）丙烯酸正戊基酯、（甲基） 丙烯酸异戊基酯（即，（甲基）丙烯酸异戊基酯)、（甲基）丙烯酸3-戊基酯、（甲基）丙烯酸2-甲基-1- 丁基酯、（甲基）丙烯酸3-甲基-1- 丁基酯、（甲基）丙烯酸正己基酯、（甲基）丙烯酸异己基酯、（甲基）丙烯酸2-甲基-1-戊基酯、（甲基）丙烯酸3-甲基-1-戊基酯、（甲基）丙烯酸4-甲基-2-戊基酯、（甲基）丙烯酸2-乙基-1- 丁基酯、（甲基）丙烯酸2-甲基-1-己基酯、（甲基）丙烯酸3, 5, 5-三甲基-1-己基酯、（甲基）丙烯酸环己基酯、（甲基）丙烯酸3-庚基酯、（甲基）丙烯酸正辛酯、  (meth) acrylic acid alkyl ester having an alkyl group having 1 to 13 carbon atoms include but are not limited to, (meth) acrylate, (meth) acrylate, (meth) acrylate, n-propyl acrylate, (meth) isopropyl acrylate, (meth) acrylate, n-butyl acrylate, (meth) acrylate, isobutyl (meth) acrylate, n-pentyl ester, (meth) acrylate, isopentyl (i.e., (meth) acrylate, isopentyl acrylate), (meth) acrylate, 3-pentyl ester, (meth) acrylate, 2-methyl-1-butyl ester, (meth) acrylate, 3-methyl-1-butyl ester, (meth) acrylate, n-hexyl acrylate, (meth) acrylate, isohexyl acrylate, (meth) acrylate, 2-methyl-1-pentyl ester, (meth) acrylate, 3-methyl-1-pentyl ester, (meth) acrylate, 4-methyl-2-pentyl ester, (meth) acrylate, 2-ethyl-1-butyl ester, (meth) acrylate, 2 - methyl-1-hexyl ester, (meth) acrylate, 3, 5, 5-trimethyl-1-hexyl ester, (meth) acrylate, cyclohexyl (meth) acrylate, 3-heptyl ester, ( meth) acrylate, n-octyl, 甲基）丙烯酸异辛酯、（甲基） 丙烯酸2-辛酯、（甲基）丙烯酸2-乙基-1-己基酯、（甲基）丙烯酸正癸基酯、（甲基）丙烯酸异癸基酯、（甲基）丙烯酸2-丙基庚基酯、（甲基）丙烯酸异壬基酯、（甲基）丙烯酸正十二烷基酯（即，（甲基）丙烯酸月桂酯)、（甲基）丙烯酸正十三烷基酯、（甲基）丙烯酸异十三烷基酯、（甲基）丙烯酸3, 7-二甲基-辛酯等。 Meth) acrylate, isooctyl (meth) acrylate, 2-octyl (meth) acrylate, 2-ethyl-hexyl ester, (meth) acrylate, n-decyl acrylate, (meth) acrylate, isodecyl ester, (meth) acrylate, 2-propyl heptyl ester, (meth) acrylate, isononyl (meth) acrylate, n-dodecyl acrylate (i.e., (meth) acrylate, lauryl acrylate), ( meth) acrylate, n-tridecyl (meth) acrylate, tridecyl (meth) acrylate, 3, 7-dimethyl - octyl ester and the like. 不是式（I)的其它合适的（甲基）丙烯酸烷基酯包括具有含至少14个碳原子但是为直链或具有单个支化点的烷基的那些。 Other suitable (meth) acrylic acid alkyl ester  is not of formula (I) include, but are those containing at least 14 carbon atoms, a straight chain or branched alkyl group having a single point. 例子包括但不限于，（甲基）丙烯酸1-十八烷基酯、（甲基）丙烯酸17-甲基-1-十七烷基酯、以及（甲基）丙烯酸1-十四烷基酯。 Examples include, but are not limited to, (meth) acrylate, 1-octadecyl (meth) acrylate, heptadecyl ester 17- methyl-1, and (meth) acrylic acid tetradecyl ester . 其它合适的非极性（甲基）丙烯酸酯为（甲基）丙烯酸芳基酯，诸如（甲基）丙烯酸苯基酯或（甲基）丙烯酸苄基酯；（甲基）丙烯酸烯基酯，诸如（甲基）丙烯酸3, 7-二甲基-6-辛烯-1-基酯以及（甲基）丙烯酸烯丙基酯；以及芳基取代的（甲基）丙烯酸烷基酯或芳氧基取代的（甲基）丙烯酸烷基酯，诸如（甲基）丙烯酸2-联苯己基酯、（甲基） 丙烯酸苄基酯、以及（甲基）丙烯酸2-苯氧基乙基酯。  Other suitable non-polar (meth) acrylate is (meth) acrylic acid aryl esters such as (meth) acrylate, phenyl (meth) acrylate, benzyl acrylate; (meth) acrylate, allyl ester, such as (meth) acrylic acid 3, 7-dimethyl-6-octen-1-yl ester and (meth) allyl methacrylate; and aryl-substituted (meth) acrylate or aryloxy-substituted (meth) acrylic acid alkyl esters such as (meth) acrylate, 2-biphenyl-hexyl ester, (meth) acrylate, benzyl acrylate, and (meth) acrylate, 2-phenoxyethyl ester. 在一些实施例中，在形成均聚物（即，使用单一可聚合材料制备的聚合物）时，期望第二单体具有相对高的Tg。  In some embodiments, the formation of homopolymers (i.e., polymers can be prepared using a single polymeric material), the second monomer desirable to have a relatively high Tg. 添加这些单体以调节弹性体材料的Tg，从而提供增强的粘附强度。 These monomers are added to adjust the Tg of the elastomeric material, to provide enhanced adhesion strength. 当通过自身聚合时，这些第二单体常常具有等于至少25°C、至少30°C、至少40°C、或至少50°C的Tg。 When the polymerization by itself, which is often a second monomer having at least equal to 25 ° C, Tg at least 30 ° C, at least 40 ° C, or at least at 50 ° C. 合适的高Tg单体包括但不限于，甲基丙烯酸甲酯、甲基丙烯酸叔丁酯、甲基丙烯酸乙酯、甲基丙烯酸正丙酯、甲基丙烯酸异丙酯、甲基丙烯酸异丁酯、甲基丙烯酸叔丁酯、 甲基丙烯酸硬脂基酯、甲基丙烯酸苯酯、甲基丙烯酸环己酯、（甲基）丙烯酸异冰片酯、甲基丙烯酸苄基酯、丙烯酸3, 3, 5-三甲基环己基酯、甲基丙烯酸环己基酯、或它们的组合。 Suitable high Tg monomers include, but are not limited to, methyl methacrylate, t-butyl methacrylate, ethyl methacrylate, n-propyl methacrylate, isopropyl methacrylate, isobutyl methacrylate methacrylate, t-butyl methacrylate, stearyl methacrylate, phenyl methacrylate, cyclohexyl acrylate, (meth) acrylate, isobornyl methacrylate, benzyl acrylate, 3, 3, 5-trimethyl-cyclohexyl methacrylate, cyclohexyl acrylate, or combinations thereof. 如果存在，则不是式（I)的非极性（甲基）丙烯酸酯中的任一种可以任何合适的量存在。  If present, the non-polar is not of formula (I) are (meth) acrylate according to any one may be present in any suitable amount. 以用于形成基于（甲基）丙烯酸的弹性体材料的可聚合材料的总重量计，此类单体的存在量可以为至多50重量％。 Based on the total weight of the elastomeric material used to form the basis of (meth) acrylic acid polymerizable material, such monomers may be present in an amount up to 50 wt%. 所述量可以为至多45重量％、至多40重量％、至多30重量％、至多20重量％、或至多10重量％。 The amount up to 45 wt%, up to 40 wt%, up to 30 wt%, up to 20 wt%, or up to 10 wt%. 例如，该单体的存在量可以在0至50重量％、1至50重量％、0至40重量％、1至40重量％、0至30重量％、1至30重量％、5至30重量％、10至30重量％、〇至20重量％、1至20重量％、5至20重量％、10至20重量％、0至10重量％、1至10重量％、或5至10重量％的范围内。 For example, the monomer is present in an amount by weight from 0 to 50 wt%, 1 to 50 wt%, 0 to 40% by weight, 1 to 40 wt%, 0 to 30 wt%, 1 to 30 wt%, 5 to 30 %, 10 to 30 wt%, square to 20 wt%, 1 to 20 wt%, 5 to 20 wt%, 10 to 20 wt%, 0 to 10 wt%, 1 to 10 wt%, or 5 to 10 wt% In the range. 第二单体可包括具有酸性基团和单个烯键式不饱和基团的单体（即，酸性单体)。  The second monomer may include a single acidic group and an ethylenically unsaturated monomeric groups (i.e., acidic monomers). 这些单体通常是极性或强极性的。 These monomers are usually polar or strongly polar. 极性（即氢键合能力）常常通过使用例如"强"、"中"和"弱"的术语进行描述。 Polarity (i.e., hydrogen-bonding ability) is often "strong", "medium" and described in "weak" term by using, for example. 描述这些和其它溶解度术语的参考文献包括"Solvents (溶剂)" (Paint Testing Manual, 3rd ed. , GG Seward, Ed. , American Society for Testing and Materials，Philadelphia，Pennsylvania (位于宾夕法尼亚费城的美国试验与材料协会的《油漆测试手册》第3 版，GG Seward 编辑））和"AThree-Dimensional Approach to Solubility (溶解度的三维方法）"（Journal of Paint Technology，Vol. 38, No. 496， pp. 269-280 (《油漆技术杂志》，第38卷，No. 496,第269-280页））。 These and other solubility terms references include "Solvents (Solvent)" (Paint Testing Manual, 3rd ed., GG Seward, Ed., American Society for Testing and Materials, Philadelphia, Pennsylvania (in the United States Testing and Materials PA Philadelphia Association "paint testing Manual," 3rd Edition, GG Seward edit)) and "aThree-dimensional Approach to solubility (three-dimensional solubility method)" (Journal of paint Technology, Vol. 38, No. 496, pp. 269-280 ( "paint technology magazine", Vol. 38, No. 496, pp. 269-280)). 烯键式不饱和基团可以为（甲基）丙烯酰基或不是（甲基）丙烯酰基的乙烯基（即，CH2=CH2-基团）。 Ethylenically unsaturated group may be a (meth) acryloyl group or not (meth) acryloyl group of vinyl (i.e., CH2 = CH2- group). 示例性的酸性单体可具有羧酸基、磺酸基、膦酸基、或它们的盐。 Exemplary monomers having a carboxylic acid group, a sulfonic acid group, a phosphonic acid group, or a salt thereof. 由于其可获得性，所以常常选择具有羧酸基或它们的盐的酸性单体。 Because of their availability, it is often selected acidic monomer having a carboxylic acid group or a salt thereof. 如果需要更强的酸性基团，则可使用具有膦酸基、磺酸基或它们的盐的单体。 If greater acidic group, may be used having a phosphonic acid group, a sulfonic acid group or a salt thereof of monomers. 酸性单体的例子包括但不限于，（甲基）丙烯酸、衣康酸、富马酸、巴豆酸、 柠康酸、马来酸、油酸、（甲基）丙烯酸β-羧乙酯、甲基丙烯酸2-磺乙基酯、苯乙烯磺酸、 2_丙烯酰胺基-2-甲基丙磺酸、乙烯基膦酸或它们的混合物。 Examples of acidic monomers include, but are not limited to, (meth) acrylic acid, itaconic acid, fumaric acid, crotonic acid, citraconic acid, maleic acid, oleic acid, (meth) acrylate, β- carboxyethyl, A yl acrylate, 2-sulfoethyl methacrylate, styrene sulfonic acid, 2_ acrylamido-2-methylpropanesulfonic acid, vinylphosphonic acid, or mixtures thereof. 可使用任何合适的酸性基团的盐。 Any suitable salt of an acidic group. 在许多实施例中，盐的阳离子为碱金属离子(例如钠、钾或锂离子)、碱土金属离子(例如钙、镁或锶离子)、铵离子，或被一个或多个烷基或芳基取代的铵离子。 In many embodiments, the cationic salt is an alkali metal ion (e.g., sodium, potassium or lithium ion), alkaline earth metal ions (e.g., calcium, strontium, or magnesium ion), an ammonium ion, or by one or more alkyl or aryl group substituted ammonium ions. 对于极性的分化而言，将给出一些例子。  For the polar differentiation, give some examples. 具体地讲，可用的强极性单体的代表为丙烯酸、甲基丙烯酸、衣康酸、丙烯酸羟烷基酯、丙烯酰胺和取代的丙烯酰胺，然而例如Ν-乙烯基吡咯烷酮、Ν-乙烯基己内酰胺、丙烯腈、氯乙烯、邻苯二甲酸二烯丙基酯和（甲基）丙烯酸Ν，Ν-二烷基氨基酯为中等极性单体的典型例子。 In particular, strongly polar Representative useful monomers are acrylic acid, methacrylic acid, itaconic acid, hydroxyalkyl acrylates, acrylamides and substituted acrylamides, e.g. Ν- however vinylpyrrolidone, vinyl Ν- caprolactam, acrylonitrile, vinyl chloride, diallyl phthalate, and esters of (meth) acrylate, Ν, Ν- dialkylamino esters are typical examples of moderately polar monomers. 极性单体的另外的例子包括丙烯酸氰基酯、富马酸、巴豆酸、柠檬酸（citronic acid)、马来酸、丙烯酸β-羧乙酯或甲基丙烯酸磺乙酯。 Further examples of polar monomers include cyanoacrylate, fumaric acid, crotonic acid, citric acid (citronic acid), maleic acid, acrylic acid or carboxyethyl acrylate β- sulfoethyl methacrylate. 如上枚举的（甲基）丙烯酸烷基酯单体为相对较弱极性的单体的典型例子。 Enumerated above, (meth) acrylic acid alkyl ester monomer as a typical example of the relatively weak polar monomer. 这些例子出于解释说明的理由而给出并且不应当被理解为限制性的。 These examples are for the reasons given of explanation and should not be construed as limiting. 对于根据本发明的多层PSA膜而言，优选限制强极性丙烯酸酯的含量以对LSE(低表面能)表面提供良好的粘附性。  For the multilayer PSA film of the present invention, strongly polar acrylate content is preferably limited to (low surface energy) surface to provide good adhesion to LSE. 从而，有利的是用于本发明PSA膜的一个或多个压敏粘合剂层的可聚合材料包含以所述可聚合材料的总重量计，至多10重量％，具体地讲1至8重量％，优选地2至6重量％的强极性丙烯酸酯。 Thus, it is advantageous for a PSA film of the present invention, one or more pressure sensitive adhesive layer may comprise a polymeric material based on the total weight of the polymerizable material, up to 10% by weight, in particular from 1 to 8 wt. %, preferably 2 to 6% by weight of the strongly polar acrylate. 在本发明的上下文中，表述"低表面能基底"意指表面能小于45达因/厘米、更典型地小于40达因/厘米、且最典型地小于35达因/厘米的那些基底。  In the context of the present invention, the expression "low surface energy substrate" means a surface energy of less than 45 dynes / cm, more typically less than 40 dynes / cm, and most typically less than 35 dynes / cm substrate. 表面能通常由例如ASTM D7490-08中所描述的接触角测量来测定。 Surface energy is typically determined by contact angle measurements as described in ASTM D7490-08, for example. 聚丙烯、聚乙烯(例如高密度聚乙烯或HDPE)、聚苯乙烯和聚（甲基丙烯酸甲酯）（ΡΜΜΑ)包括在这种材料中。 Polypropylene, polyethylene (e.g., high density polyethylene or HDPE), polystyrene and poly (methyl methacrylate) (ΡΜΜΑ) included in such materials. 其他基底也可由于在基底的表面上有残余物(如油状残余物）或薄膜(如涂料）的原因而具有低表面能性质。 Other substrates may also be due to residues on the surface of the substrate reason (e.g., oily residue) or film (such as paint) having a low surface energy properties. 丙烯酸PSA通常衍生自石油原料。  The acrylic PSA typically derived from petroleum feedstocks. 油价的上涨以及同时上涨的石油衍生产品的价格，导致许多粘合剂产品的价格和供应不稳。 Prices rising oil prices and the simultaneous rise of petroleum-derived products, resulting in many adhesive product price and supply instability. 因此，非常希望能用衍生自可再生来源(例如植物）的原料来替代全部或部分石油基原料，因为这些材料相对便宜，并因此具有经济和社会效益。 Therefore, highly desirable to use raw materials derived from renewable sources (e.g., plants) to replace all or part of the petroleum-based raw materials, because these materials are relatively inexpensive, and thus has economic and social benefits. 因此，对这些衍生自植物的材料的需求已变得日益显著。 Therefore, the demand for these materials are derived from plants have become increasingly significant. 在优选的实施例中，本发明提供了用于本发明多层PSA膜的(至少一个）相对层的组合物，其衍生自可再生资源。  In a preferred embodiment, the present invention provides (at least one) of the composition for a multilayer film of the present invention is relatively PSA layer, which are derived from renewable resources. 具体地讲，本发明提供多层PSA膜的相对层的组合物，其至少部分地衍生自植物材料。 In particular, the present invention provides a composition layer opposite the multilayer PSA film, at least partially derived from plant material. 这包括以下实施例，其中不仅多层PSA膜的一个层而且其多个或所有层均衍生自可再生资源。 This embodiment includes the following embodiments in which only one layer of the multilayer PSA film and its more or all layers are derived from renewable resources. 在此类另外优选的实施例中，根据本发明的多层PSA膜的特征在于，用于形成对应层的聚合物基体材料的可聚合前体包含（甲基）丙烯酸2-辛酯， 其中所述可聚合前体优选地包含85至99. 5重量％，更优选地90至99. 5重量％的（甲基） 丙稀酸2-辛酯（以用于形成对应层（corresponding layers)的可聚合混合物的总重量计)。 In a further preferred embodiment of such embodiments, the multilayer PSA films according to the characteristics of the present invention is used to form the polymeric matrix material may be the corresponding layer comprising a polymeric precursor (meth) acrylate, 2-octyl, wherein said polymeric precursor may preferably comprise from 85 to 99.5 wt%, more preferably from 90 to 99.5% by weight of (meth) acrylic acid 2-octyl ester (for forming the corresponding layer (corresponding layers) of the polymerizable mixture total weight). 根据本发明多层PSA膜的更优选的实施例，用于形成相对层的聚合物基体材料的可聚合前体包含（甲基）丙烯酸2-辛酯，其中所述可聚合前体优选地包含85至99. 5重量％，更优选地90至99. 5重量％的（甲基）丙稀酸2-辛酯（以用于形成相对层（opposing layer)的可聚合混合物的总重量计)。 The polymeric precursor may be a more preferred embodiment of the multilayer PSA film of the invention, for forming the polymer matrix comprises a material having a relatively layer (meth) acrylate, 2-octyl acrylate, wherein said polymeric precursor preferably comprises 85 to 99.5 wt%, more preferably from 90 to 99.5% by weight of (meth) acrylic acid 2-octyl ester (to form a polymerizable mixture for opposing layers (opposing layer) of the total weight) . 包含（甲基）丙烯酸2-辛酯的基于丙烯酸的组合物具体描述于US-B2-7, 385, 020 中，其内容以引用方式并入本文。  comprising a (meth) acrylate, 2-octyl acrylate ester-based composition is described in detail in US-B2-7, 385, 020, the contents of which are incorporated by reference herein. 当与（甲基）丙烯酸辛酯的其它异构体(诸如（甲基）丙烯酸正辛酯和（甲基） 丙烯酸异辛酯）相比时，衍生自（甲基）丙烯酸2-辛酯的优选的相对层的组合物提供了可比性。  When compared with the (meth) acrylate, octyl other isomers (such as the (meth) acrylate, n-octyl (meth) acrylate, isooctyl acrylate), derived from (meth) acrylate, 2 octyl preferred composition layer provides relatively comparable. 另外，本发明的相对层组合物具有比衍生自其它辛基异构体(诸如丙烯酸异辛酯）的粘合剂更低的粘度。 Further, the relative layer composition of the present invention has a lower viscosity than the binder are derived from other octyl isomers (such as isooctyl acrylate) is. 有利地，粘度越低的组合物越容易涂覆。 Advantageously, the easier the lower the viscosity of the coating composition. 可以通过常规技术由2-辛醇和（甲基）丙烯酰衍生物例如酯、酸和卤酰制备（甲基）丙烯酸2-辛酯。  2-octanol and may be made of (meth) acrylic acid derivatives such as esters, acids and acyl halides Preparation of (meth) acrylate, 2-octyl ester by conventional techniques. 2-辛醇可以通过用氢氧化钠处理衍生自蓖麻油的蓖麻酸(或其酯或卤酰)，之后将其从副产品癸二酸中蒸馏出而制备。 2-octanol can be prepared by a process derived from castor oil, ricinoleic acid (or ester or acyl halides) with sodium hydroxide, after which distilled from sebacic acid by-products. 然而，通常非必需使用链转移剂。  Typically, however, the chain transfer agent optionally used. 申请人已发现以相同的浓度并且在相同聚合条件下，与异构的（甲基）丙烯酸辛酯相比，本发明的（甲基）丙烯酸2-辛酯组合物通常具有更低的特性粘度和溶液粘度。 Applicant has found that at the same concentration and under the same polymerization conditions, compared with the heterogeneous (meth) acrylate, octyl (meth) acrylate, 2-octyl ester composition of this invention typically have a lower intrinsic viscosity and solution viscosity. 不受理论的束缚，据信本发明的（甲基）丙烯酸辛酯(在酯羟基氧原子α位连有叔氢原子）起到"内部"链转移剂的作用以控制分子量。 Without being bound by theory, it is (meth) acrylate, octyl present invention are believed (hydroxyl oxygen atoms in the ester with a tertiary α position hydrogen atom attached) functions as the "inner" chain transfer agent to control molecular weight. 还优选相对层至少部分衍生自生物材料，具体地讲衍生自植物材料，然而特别是至少25重量％，优选地至少40重量％的单体衍生自生物材料。  Also preferably opposing layer at least partially derived from a biological material, in particular derived from plant material, however, in particular at least 25 wt%, preferably at least 40% by weight of a monomer derived from a biological material. 这是有利的，以便提供多层PSA膜，所述膜至少部分来自"绿色"来源，在生态上更加可持续并且还减少了对矿物油的依赖性及其价格发展。 This is advantageous in order to provide a multilayer PSA film, at least in part from the "green" sources, ecologically more sustainable in the film and also reduces the dependency on mineral oil and the price development. 术语"衍生自生物材料"是指某些化学成分，其化学结构的至少一部分，具体地讲其结构的至少50重量％来自生物材料。 The term "biologically derived material" refers to certain chemicals, at least part of its chemical structure, in particular at least 50 wt% of the structure from the biological material. 该定义原则上与生物柴油相同，其中通常仅脂肪酸部分来自生物来源，然而甲醇也可衍生自化石材料，如煤或矿物油。 It defines the same principle biodiesel, wherein the fatty acid portion typically only from a biological source, however methanol also be derived from fossil materials such as coal or mineral oil. 根据本发明的优选的方面，从而，多层PSA膜包含（甲基）丙烯酸2-辛酯，尤其优选的是（甲基）丙烯酸2-辛酯完全（即，100重量％)衍生自生物材料。  According to a preferred aspect of the present invention, thus, a multilayer film comprising a PSA (meth) acrylate, 2-octyl, particularly preferred are (meth) acrylate, 2-octyl completely (i.e., 100 wt%) derived from from biological materials. 不一定衍生自生物来源的其它合适的第二单体为具有单个烯键式不饱和基团和羟基的单体。  are not necessarily derived from other biological sources suitable for the second monomer having a single ethylenically unsaturated monomer and a hydroxyl group. 这些单体趋于极性。 These monomers tend polarity. 烯键式不饱和基团可以为（甲基）丙烯酰基或不是（甲基）丙烯酰基的乙烯基（即，CH2=CH2基团）。 Ethylenically unsaturated group may be a (meth) acryloyl group or not (meth) acryloyl group of vinyl (i.e., CH2 = CH2 group). 具有羟基的示例性单体包括但不限于，（甲基） 丙烯酸羟烷基酯(例如，丙烯酸-2-羟基乙酯或丙烯酸-3-羟基丙酯)、羟烷基（甲基)丙烯酰胺(例如，2-羟乙基丙烯酰胺或3-羟丙基丙烯酰胺)，和乙氧基化的甲基丙烯酸羟乙酯(例如，可以商品名CD570、CD571、CD572购自沙多玛公司（Sartomer)的单体)。 Exemplary monomers having a hydroxyl group include, but are not limited to, (meth) acrylate, hydroxyalkyl esters (e.g., 2-hydroxyethyl acrylate or 3-hydroxy propyl acrylate), hydroxyalkyl (meth) acrylamide (e.g., 2-hydroxyethyl or 3-hydroxypropyl acrylamide acrylamide), and ethoxylated hydroxyethyl methacrylate (e.g., trade name CD570, CD571, CD572, available from Sartomer ( Sartomer) monomers). 其它合适的极性第二单体为具有单个烯键式不饱和基团和含氮基团或它们的盐的单体。  Other suitable monomers having a single polarity of the second ethylenically unsaturated group and a nitrogen-containing group or a salt thereof monomers. 这些单体中大部分趋于极性。 Most of these monomers tend polarity. 烯键式不饱和基团可以为（甲基）丙烯酰基或不是(甲基）丙烯酰基的乙烯基（即，ch2=ch2基团）。 Ethylenically unsaturated group may be a (meth) acryloyl group or not (meth) acryloyl group of vinyl (i.e., ch2 = ch2 group). 含氮基团的例子包括但不限于仲酰氨基和叔酰氨基。 Examples of nitrogen-containing groups include, but are not limited to, secondary amido groups and tertiary amido. 示例性的具有仲酰氨基的极性单体包括但不限于N-烷基（甲基）丙烯酰胺，如N-甲基丙烯酰胺、N-乙基丙烯酰胺、N-异丙基丙烯酰胺、叔辛基丙烯酰胺或N-辛基丙烯酰胺。 Exemplary polar monomer having a secondary amido groups include, but are not limited to, N- alkyl (meth) acrylamides, such as N- methyl acrylamide, N- ethyl acrylamide, N- isopropylacrylamide, tert-octyl acrylamide, octyl acrylamide, or N-. 示例性的具有叔酰氨基的极性单体包括但不限于N-乙烯基己内酰胺、N-乙烯基-2-吡咯烷酮、丙烯酰基吗啉和N，N-二烷基丙烯酰胺，如N，N-二甲基丙烯酰胺、N，N-二乙基丙烯酰胺、N，N-二丙基丙烯酰胺和N，N-二丁基丙烯酰胺。 Exemplary polar monomer having a tertiary amido groups include, but are not limited to, N- vinyl caprolactam, N- vinyl-2-pyrrolidone, acryloyl morpholine and N, N- dialkyl acrylamides, such as N, N - dimethylacrylamide, N, N- diethyl-acrylamide, N, N- dipropyl-acrylamide and N, N- dibutyl acrylamide. 其它合适的极性第二单体包含单个烯键式不饱和基团和醚基（即，包含至少一个式-R-0-R-的亚烷基-氧-亚烷基的基团，其中每个R为具有1至4个碳原子的亚烷基)。  Other suitable polar monomer comprises a second single ethylenically unsaturated group and an ether group (i.e., comprising at least one alkylene group of formula -R-0-R- is - O - alkylene group group, wherein each R is an alkylene group having 1 to 4 carbon atoms). 这些单体趋于极性。 These monomers tend polarity. 示例性的单体包括但不限于烷氧基化的（甲基）丙烯酸烷基酯，诸如丙烯酸卡必酯、丙烯酸-2-甲氧基乙酯和丙烯酸-2-乙氧基乙酯；以及聚(环氧烷）丙烯酸酯，诸如聚(环氧乙烷）丙烯酸酯和聚(环氧丙烷）丙烯酸酯。 Exemplary monomers include, but are not limited to, alkoxylated (meth) acrylate, carbitol acrylate such as acrylate, 2-methoxyethyl acrylate and 2-ethoxyethyl acrylate; and poly (alkylene oxide) acrylates, such as poly (ethylene oxide) acrylates and poly (propylene oxide) acrylates. 聚(环氧烷）丙烯酸酯通常称为聚(烷撑二醇)丙烯酸酯。 Poly (alkylene oxide) acrylate commonly known as poly (alkylene glycol) acrylate. 这些单体可具有任何合适的端基，如羟基或烷氧基。 These monomers may have any suitable end groups, such as hydroxy or alkoxy. 例如，当端基为甲氧基时，单体可称为甲氧基聚（乙二醇）丙烯酸酯。 For example, when the end group is a methoxy group, a monomer may be referred to as methoxy poly (ethylene glycol) acrylate. 可加入各种极性单体以增加本发明PSA膜的一个或多个压敏粘合剂层的压敏粘合剂对相邻层诸如基底或背衬层的粘附性，增强基于（甲基）丙烯酸的弹性体材料的内聚强度，或上述两者。  The polar monomer may be added to increase the variety of a PSA film of the present invention, one or more pressure sensitive adhesive layer of a pressure sensitive adhesive layer adjacent the backing layer or the substrate, such as adhesion, enhanced based on the cohesive strength of the elastomeric material (meth) acrylic acid, or both. 任何极性单体或它们的盐均可以任何合适的量存在。 Any polar monomer or a salt thereof can be present in any suitable amount. 在一些实施例中， 以用于形成基于（甲基）丙烯酸的弹性体材料的可聚合材料的总重量计，极性单体的存在量为至多15重量％。 In some embodiments, for forming a polymerizable material based on an elastomeric material, (meth) acrylic acid on the total weight of the polar monomer is present in an amount of up to 15 wt%. 该含量常常为至多10重量％或至多5重量％。 The content is often up to 10% or up to 5 wt%. 例如，极性单体的存在量可以在0至15重量％、0. 5至15重量％、1至15重量％、0至10重量％、0. 5至10重量％、 1至10重量％、〇至5重量％、0. 5至5重量％、或1至5重量％的范围内。 For example, polar monomer may be present in an amount of 0 to 15% by weight, 0.5 to 15 wt%, 1 to 15 wt%, 0 to 10% by weight, 0.5 to 10 wt%, 1-10 wt% , square to 5% by weight, 0.5 to 5 wt%, or from 1 to 5% by weight. 用于形成根据本发明的多层PSA膜用压敏粘合剂聚合物的组合物还可包含一种或多种其它乙烯基单体诸如乙烯基酯(例如乙酸乙烯酯和丙酸乙烯酯）；苯乙烯或它们的衍生物诸如烷基取代的苯乙烯(例如，α -甲基苯乙烯）；乙烯基卤化物；或它们的混合物。  The multilayer PSA film for forming according to the present invention, a pressure sensitive adhesive polymer composition may further comprise one or more other vinyl monomers such as vinyl esters (e.g., vinyl acetate and propionate vinyl acetate); styrene or derivatives thereof such as alkyl-substituted styrenes (e.g., α - methylstyrene); vinyl halides; or mixtures thereof. 这些单体可以是极性或非极性的。 These monomers may be polar or non-polar. 如果存在，则这些其它乙烯基单体可以任何合适的量存在。 If present, these other vinyl monomers may be present in any suitable amount. 在一些实施例中，以用于形成基于（甲基）丙烯酸的弹性体材料的可聚合材料的总重量计， 乙烯基单体的存在量可以为至多5重量份。 In some embodiments, for forming a polymerizable material based on an elastomeric material, (meth) acrylic acid on the total weight of the vinyl monomer may be present in an amount of up to 5 parts by weight. 例如，乙烯基单体的用量可以为至多4重量％， 至多3重量％，或至多2重量％。 For example, the vinyl monomers may be used in an amount up to 4 wt%, at most 3 wt%, or up to 2 wt%. 在一些实施例中，乙烯基单体的存在量在0至5重量％，0. 5 至5重量％，1至5重量％，0至3重量％，或1至3重量％范围内。 In some embodiments, the range of the vinyl monomer is present in an amount of 0 to 5 wt%, 0.5 to 5% by weight, 1 to 5 wt%, 0 to 3 wt%, or 1 to 3 wt%. 可使用交联剂作为第二单体。  The crosslinking agent may be used as the second monomer. 交联剂常常提高基于（甲基）丙烯酸的弹性体材料的内聚强度和拉伸强度。 Often based crosslinking agent to improve cohesive strength and tensile strength of the elastomeric material (meth) acrylic acid. 交联剂可具有能够与第一单体和另一种第二单体聚合的至少两个官能团。 Crosslinkers may have at least two functional groups polymerizable with the first monomer and a second monomer of another. 即，交联剂可具有至少两个烯键式不饱和基团。 That is, the crosslinking agent may be a group having at least two ethylenically unsaturated. 合适的交联剂常常具有多个（甲基）丙烯酰基。 Suitable crosslinking agents often have a plurality of (meth) acryloyl group. 作为另外一种选择，交联剂可具有至少两个基团，所述基团能够与另一第二单体上的多种官能团（g卩，不是烯键式不饱和基团的官能团)反应。 Alternatively, the crosslinking agent may have at least two groups, said group capable of reacting with various functional groups (g Jie, a functional group is not ethylenically unsaturated group) on another second monomer . 例如，交联剂可具有多个基团，所述基团能够与其它第二单体上的官能团诸如酸性基团反应。 For example, the crosslinking agent may have a plurality of groups, said group capable of reacting with functional groups on other monomers such as a second acidic group. 具有多个（甲基）丙烯酰基的交联剂可以为二（甲基）丙烯酸酯、三（甲基）丙烯酸酯、四（甲基）丙烯酸酯、五（甲基）丙烯酸酯等。  having a plurality of (meth) acryloyl groups in the crosslinking agent may be di (meth) acrylate, pentaerythritol tri (meth) acrylate, tetra (meth) acrylate, penta (meth) acrylate . 这些交联剂可以例如通过使（甲基） 丙烯酸与多元醇（即，具有至少两个羟基的醇）反应而形成。 These crosslinking agents may be formed by, for example, (meth) acrylic acid with a polyhydric alcohol (i.e., having at least two hydroxyl groups) reaction. 所述多元醇通常具有两个、三个、四个或五个羟基。 The polyol generally has two, three, four or five hydroxy. 可使用交联剂的混合物。 Combinations of crosslinking agents may be used. 在许多实施例中，交联剂包含至少两个（甲基）丙烯酰基。  In many embodiments, the crosslinking agent comprises at least two (meth) acryloyl group. 具有两个丙烯酰基的示例性交联剂包括二丙烯酸1，2-乙二醇酯、二丙烯酸1，3-丙二醇酯、二丙烯酸1，9-壬二醇酯、二丙烯酸1，12-十二烷二醇酯、二丙烯酸1，4-丁二醇酯、二丙烯酸1，6-己二醇酯、二丙烯酸丁二醇酯、双酚A二丙烯酸酯、二丙烯酸二乙二醇酯、二丙烯酸三乙二醇酯、二丙烯酸四乙二醇酯、二丙烯酸三丙二醇酯、聚乙二醇二丙烯酸酯、聚丙二醇二丙烯酸酯、聚乙烯/ 聚丙烯共聚物二丙烯酸酯、聚丁二烯二（甲基）丙烯酸酯、丙氧基化的三（甲基）丙烯酸甘油酯、和新戊二醇羟基新戊酯二丙烯酸酯改性的己内酯。 Exemplary crosslinking agents having two acryloyl groups include ethylene glycol diacrylate diacrylate, 1,3-propanediol diacrylate, 1,9-nonanediol diacrylate, 1,12 alkanediol diacrylate, 1,4-butanediol diacrylate, 1,6-hexanediol diacrylate, butanediol diacrylate, bisphenol A diacrylate, diethylene glycol diacrylate, di triethylene glycol diacrylate, tetraethylene glycol diacrylate, tripropylene glycol diacrylate, polyethylene glycol diacrylate, polypropylene glycol diacrylate, polyethylene / polypropylene copolymer diacrylate, polybutadiene di (meth) acrylate, propoxylated tri (meth) diacrylate modified acrylate, and neopentyl glycol hydroxypivalate neopentyl caprolactone. 具有三个或四个（甲基）丙烯酰基的示例性交联剂包括但不限于三羟甲基丙烷三丙烯酸酯（例如可以商品名TMPTA-N从佐治亚州士麦那的氰特工业公司（Cytec Industries，Inc.，Smyrna，GA)商购获得和以商品名SR-351从宾夕法尼亚州埃克斯顿的沙多玛公司（Sartomer，Exton，PA)商购获得)、季戊四醇三丙稀酸酯(例如可以商品名SR-444 从沙多玛公司（Sartomer)商购获得)、三（2-羟乙基异氰脲酸酯）三丙烯酸酯(可以商品名SR-368从沙多玛公司（Sartomer)商购获得)、季戊四醇三丙烯酸酯和季戊四醇四丙烯酸酯的混合物(例如，可以商品名PETIA (其中四丙烯酸酯与三丙烯酸酯的比例为大约1:1)和商品名PETA-K (其中四丙烯酸酯与三丙烯酸酯的比例为大约3:1)从氰特工业公司（Cytec Industries，Inc. )商购获得)、季戊四醇四丙稀酸酯(例如可以商品名SR-295从沙多玛公司（Sartomer)商购获得)、二-  having three or four (meth) acryloyl Exemplary crosslinking agents include but are not limited to, triacrylates trimethylolpropane (e.g. tradename TMPTA-N from cyano Smyrna, Georgia special industrial company (Cytec Industries, Inc., Smyrna, GA) and commercially available under the trade name SR-351 from Sartomer of Exton, Pennsylvania, company (Sartomer, Exton, PA) commercially available), pentaerythritol propylene esters (e.g., trade name SR-444 commercially available from Sartomer (Sartomer) and Suppliers), tris (2-hydroxyethyl isocyanurate) triacrylate (available as SR-368 from Sartomer company (Sartomer) commercially available), tetraacrylate mixture of pentaerythritol triacrylate and pentaerythritol esters (e.g., trade name PETIA (wherein the ratio of tetraacrylate to triacrylate between about 1: 1) and the trade name of PETA-K (wherein the ratio of tetraacrylate to triacrylate between about 3: 1) from Cytec industries Inc. commercially available), pentaerythritol tetrakis acrylic ester (e.g. the trade name SR-295 from the sand (Cytec industries, Inc.) Sodom company (Sartomer) commercially available), two - 羟甲基丙烷四丙烯酸酯(例如可以商品名SR-355从沙多玛公司（Sartomer)商购获得)，以及乙氧基化的季戊四醇四丙烯酸酯(例如可以商品名SR-494 从沙多玛公司（Sartomer)商购获得)。 Ditrimethylolpropane tetraacrylate (e.g., trade name SR-355 commercially available from Sartomer (Sartomer) List), and ethoxylated pentaerythritol tetraacrylate (e.g., trade name SR-494 from Sartomer company (Sartomer) commercially available). 具有五个（甲基）丙烯酰基的示例性交联剂包括但不限于，五丙烯酸二戊赤藓醇酯(例如可以商品名SR-399从沙多玛公司（Sartomer)商购获得)。 Has five (meth) acryloyl Exemplary crosslinkers include, but are not limited to, dipentaerythritol pentaacrylate esters (e.g., trade name SR-399 commercially available from Sartomer (Sartomer) supplier). 在一些实施例中，交联剂为包含至少两个（甲基）丙烯酰基的聚合物材料。  In some embodiments, the crosslinking agent is a polymeric material comprising at least two (meth) acryloyl group. 例如， 交联剂可为具有至少两个丙烯酰基的聚（环氧烷）（例如可购自沙多玛公司（Sartomer)的聚乙二醇二丙烯酸酯，如SR210、SR252和SR603)或具有至少两个（甲基）丙烯酰基的聚(氨酯）（例如获自沙多玛公司（Sartomer)的聚氨酯二丙稀酸酯，如CN9018)。 For example, the crosslinking agent may have at least two acryloyl groups in the poly (alkylene oxide) (e.g., commercially available from Sartomer (Sartomer) of polyethylene glycol diacrylate, such as SR210, SR252 and SR603) or with a at least two (meth) acryloyl poly (urethane) (e.g. available from Sartomer (Sartomer) of polyurethane di acrylic esters, such as CN9018). 随着较高分子量的交联剂增加，所得丙烯酸类共聚物趋于在断裂之前具有较高伸长。 With the increase of the higher molecular weight crosslinking agent, the acrylic copolymer obtained tends to have a higher elongation before breaking. 聚合物交联剂往往比它们的非聚合对应物以更大的重量百分数含量使用。 Polymer crosslinking agents tend to use a larger than their weight percent content of non-polymeric counterparts. 除了具有至少两个（甲基）丙烯酰基的那些之外，可使用其它类型的交联剂。  In addition to having at least two (meth) acryloyl group in addition to those of other types of crosslinking agents may be used. 交联剂可具有多个基团，所述基团能够与其它第二单体上的官能团诸如酸性基团反应。 The crosslinking agent may have a plurality of groups, said group capable of reacting with functional groups on other monomers such as a second acidic group. 例如， 可使用具有与羧基反应的多个氮丙啶基的单体。 For example, a monomer having a plurality of aziridinyl groups reacted with carboxyl groups. 例如，交联剂可以为双酰胺交联剂，如美国专利6, 777, 079 (Zhou等人）中所述。 For example, the crosslinking agent may be a bisamide crosslinker as described in U.S. Patent No. 6, 777, 079 (Zhou et al.). 在其它交联方法中，加入光交联剂(例如，UV光交联剂)。  In other crosslinking methods, the crosslinking agent is added to the light (e.g., UV light cross-linking agent). 这些光交联剂可与用于形成弹性体材料的多种单体(例如可共聚的二苯甲酮）共聚，或可在聚合之后添加。 The photocrosslinking agent may be used to form the elastomeric material with a plurality of monomers (e.g., copolymerizable benzophenone) copolymer, or may be added after the polymerization. 在聚合之后添加的适宜的光交联剂包括，例如多官能二苯甲酮、三嗪(如XL-330,其为得自明尼苏达州圣保罗市的3厘公司的（31(：〇11^^1^，331拉？3111，丽）的2,4，-双（三氯甲基）-6-(4-甲氧基苯基）-三嗪)、苯乙酮等。 Suitable photocrosslinking agent is added after polymerization include, for example, polyfunctional benzophenones, triazines (e.g., XL-330, which is available from St. Paul, Minnesota company 3% (31 (: ^^ 〇11 ? 1 ^, 331 pull-3111, Korea) of 2,4 - bis (trichloromethyl) -6- (4-methoxyphenyl) - triazine), and acetophenone. 在其它交联方法中，可使用热交联剂，其任选与合适的促进剂和阻滞剂组合。  In other crosslinking methods, heat crosslinking agent may be used, optionally in combination with a suitable accelerator and retarder combination. 用于本文的适宜的热交联剂包括但不限于，异氰酸酯，更具体地讲不含封端剂的三聚异氰酸酯和/或位阻型异氰酸酯，或者环氧化合物，如环氧化物-胺交联剂体系。 Suitable thermal crosslinking agents for use herein include, but are not limited to, isocyanates, more particularly trimerized polyisocyanate excluding the blocking agent and / or a sterically hindered isocyanates or epoxy compounds, such as epoxy - amine cross linking agent system. 有利的交联剂体系和方法描述于例如DE202009013255U1、EP2305389A、EP2414143A、EP2192148A、EP2186869、 EP0752435A、EP1802722A、EP1791921A、EP1791922A、EP1978069A、和DE102008059050A 的说明书中，其相关内容以引用方式并入本文。 Advantageously crosslinker system and method described in example DE202009013255U1, EP2305389A, EP2414143A, EP2192148A, EP2186869, EP0752435A, EP1802722A, EP1791921A, EP1791922A, EP1978069A, and DE102008059050A description, the relevant contents of which are incorporated herein by reference. 适用于本文的促进剂和阻滞剂体系描述于例如US-A1-2011/0281964的说明书中，其相关内容以引用方式明确地并入本文。 Suitable for use herein accelerator and retarder systems are described in, for example, specification US-A1-2011 / 0281964, the relevant contents of which are expressly incorporated by reference herein. 尤其适用于本文的热交联剂包括环氧环己基衍生物，具体地讲环氧环己基羧酸酯衍生物，其中特别优选(3, 4-环氧环己烷）甲基3, 4-环氧环己基羧酸酯，其可以商品名UVA⑶RE1500从氰特工业公司（Cytec Industries Inc.)商购获得。 Especially suitable for use herein comprises a thermal crosslinking agent epoxycyclohexyl derivatives, in particular epoxycyclohexyl carboxylate derivative being particularly preferred (3, 4-epoxycyclohexane) methyl-3, 4- epoxycyclohexyl carboxylate, UVA⑶RE1500 tradename commercially available from Cytec industries (Cytec industries Inc.). 如果存在，则交联剂可以任何合适的量使用。  If present, the crosslinking agent may be used in any suitable amount. 在许多实施例中，以可聚合材料的总重量计，交联剂的存在量为至多5重量份。 In many embodiments, the polymerizable material to the total weight of the crosslinking agent is present in an amount of up to 5 parts by weight. 在一些实施例中，交联剂的存在量为至多4重量％、至多3重量％、至多2重量％、或至多1重量％。 In some embodiments, the crosslinking agent is present in an amount up to 4 wt%, at most 3% by weight, up to 2 wt%, or up to 1 wt%. 交联剂的存在量可以为例如大于0. 01 重量％、大于〇. 05重量％、或大于1重量％。 The crosslinking agent is present in an amount greater than 0.01 wt%, e.g., greater than square. 05 wt%, or more than 1 wt%. 在一些实施例中，交联剂的存在量在0至5重量％、0. 01至5重量％、0. 05至5重量％、0至3重量％、0. 01至3重量％、0. 05至3重量％、0 至1重量％、0. 01至1重量％、或0. 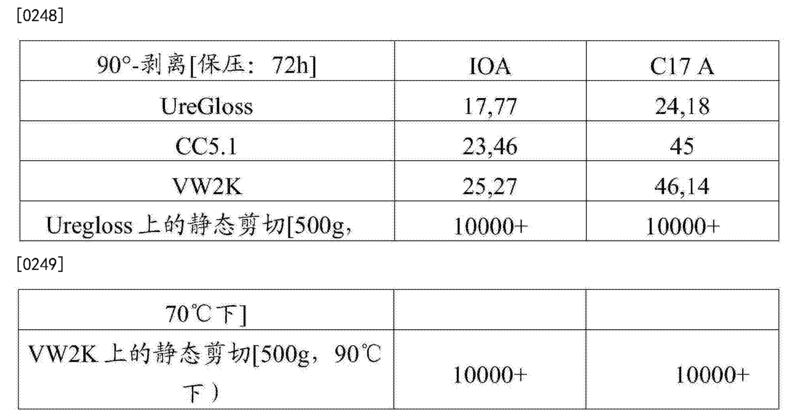 05至1重量％的范围内。 In some embodiments, the crosslinking agent is present in an amount of 0 to 5 wt%, from 0.01 to 5% by weight, 0.05 to 5 wt%, 0-3 wt.%, 0.01 to 3 wt%, 0 05 to 3 wt%, 0-1 wt.%, 0.01 to 1 wt%, or from 0.05 to 1% by weight. 作为添加交联剂、光交联剂或热交联剂的可供选择的方案，可使用高能电磁辐射诸如γ辐射或电子束辐射使基于（甲基）丙烯酸的弹性体材料交联。  As a crosslinking agent, thermal crosslinking agent or photocrosslinking agent alternatives, using high energy electromagnetic radiation such as γ radiation or electron beam radiation-based elastomer material (meth) acrylic acid crosslinked . 在一些方面，根据本发明的多层PSA膜的基于（甲基）丙烯酸的弹性体材料由以可聚合材料的总重量计，至少50重量％的式（I)的第一单体和至多50重量％的第二单体制备。  In some aspects, the elastomeric material based on (meth) acrylic acid by total weight of the polymerizable material, at least 50% by weight of a first monomer of formula (I) according to the multilayer PSA film of the present invention and up to 50% by weight of the second monomer was prepared. 第二单体可以为上述单体中的任一种。 The second monomer may be any of the above monomers. 例如，第二单体可以为不是式（I)的非极性(甲基）丙烯酸酯、不具有（甲基）丙烯酰基的非极性乙烯基单体、极性单体、交联剂或它们的组合。 For example, instead of formula (I), a second non-polar monomer (meth) acrylates, (meth) acryloyl group of non-polar vinyl monomers, polar monomers, or crosslinking agent a combination thereof. 一些基于（甲基）丙烯酸的弹性体材料由50至99. 5重量％的第一单体和0. 5至50重量％的第二单体，50至99重量％的第一单体和1至50重量％的第二单体，60至99重量％的第一单体和1至40重量％的第二单体，70至99重量％的第一单体和1至30重量％ 的第二单体，80至99重量％的第一单体和1至20重量％的第二单体，85至99重量％的第一单体和1至15重量％的第二单体，或90至99重量％的第一单体和1至10重量％的第二单体形成。 Some elastomeric materials based on (meth) acrylic acid from 50 to 99.5% by weight of the first monomer and 0.5 to 50 wt% of a second monomer, 50 to 99% by weight of the first monomer and 1 to 50% by weight of the second monomer, from 60 to 99% by weight of the first monomer and 1 to 40 wt% of a second monomer, 70 to 99% by weight of the first monomer and 1 to 30 wt% of two monomers, from 80 to 99% by weight of the first monomer and 1 to 20 wt% of a second monomer, 85 to 99% by weight of the first monomer and 1 to 15 weight percent of the second monomer, or 90 to 99% by weight of the first monomer and 1 to 10 weight percent of the second monomer. 重量百分比以用于形成基于（甲基）丙烯酸的弹性体材料的可聚合材料的总重量计。 Percentages by weight based on the total weight of the form for the polymeric material may be elastomeric material (meth) acrylic acid. 在一些更具体的实施例中，用于根据本发明多层PSA膜的基于（甲基）丙烯酸的弹性体材料由可聚合材料制备，所述可聚合材料包括至少50重量％的式（I)的第一单体和至多15重量％的第二单体，所述第二单体为极性单体。  In some more specific embodiments, the elastomeric material based on (meth) acrylic acid can be prepared from polymerizable multilayer PSA film material of the present invention, the polymerizable material comprises at least 50 wt% of the formula (I) a first monomer and up to 15 wt% of a second monomer, the second monomer is a polar monomer. 例如，可聚合材料可包括50至99. 5 重量％的式（I)单体和0. 5至15重量％的极性单体，50至99重量％的式（I)单体和1至15重量％的极性单体，60至99重量％的式（I)单体和1至15重量％极性单体，70至99重量％的式（I)单体和1至15重量％极性单体，80至99重量％的式（I)单体和1至15重量％ 极性单体，或85至99重量％的式（I)单体和1至15重量％极性单体。 For example, the polymerizable material may comprise from 50 to 99.5% by weight of the formula (I) monomer and 0.5 to 15 wt% of a polar monomer, 50 to 99 wt% of formula (I) and a monomer to 15% by weight of the polar monomer, from 60 to 99% by weight of the formula (I) monomer and from 1 to 15% by weight of a polar monomer, 70-99% by weight of the formula (I) monomer and from 1 to 15 wt% polar monomer, 80-99 wt% of formula (I) monomer and 1 to 15% by weight of the polar monomer, or 85 to 99 wt% of formula (I) monomer and 1 to 15% by weight of polar monomer body. 可将不是式（I)的其它非极性单体、交联剂或上述两者加入这些可聚合材料的任一种中以使总量达到100重量％。 May be any other non-polar monomers are not of formula (I), the addition of a crosslinking agent, or both of these polymerizable material to make the total amount 100% by weight. 例如，可聚合材料可包括至少1重量％，诸如1至30重量％、1至20重量％、或1至10 重量％的不是式（I)的非极性单体。 For example, the polymerizable material may comprise at least 1 wt%, such as 1-30 wt%, the non-polar monomer 1 to 20% by weight, or 1 to 10% by weight is not of formula (I) are. 又如，可聚合材料中的任一种可包括至多5重量％，诸如0. 01至5重量％、0. 05至5重量％、或1至5重量％的交联剂。 As another example, any one of the polymerizable material may comprise up to 5 wt%, such as 0.01 to 5 wt%, from 0.05 to 5 wt%, or 1 to 5% by weight of a crosslinking agent. 通常将用于自由基聚合的引发剂加入用于形成基于（甲基）丙烯酸的弹性体材料的各种单体中。  generally used in radical polymerization initiator based on the monomers used to form various elastomeric material (meth) acrylic acid in the. 聚合引发剂可以为热引发剂、光引发剂或上述两者。 The polymerization initiator can be a thermal initiator, a photoinitiator, or both of the above agents. 可使用已知用于自由基聚合反应的任何合适的热引发剂或光引发剂。 It may be any suitable known thermal radical polymerization initiator or a photoinitiator. 以可聚合材料的总重量计，引发剂在第一可聚合混合物中的存在量通常在0. 01至5重量％的范围内、在0. 01至2重量％的范围内、 在0.01至1重量％的范围内、或在0.01至0.5重量％的范围内。 Based on the total weight of the polymerizable material, the polymerization initiator may be in a first mixture in an amount generally in the range from 0.01 to 5% by weight, in the range of 0.01 to 2% by weight, at 0.01 to 1 % by weight of the range, or in the range of 0.01 to 0.5% by weight. 如本文所用，可聚合混合物（即可聚合反应混合物）是指可聚合材料加上加入可聚合材料中以制备聚合产物的任何其它组分。  As used herein, polymerizable mixture (i.e., the polymerization reaction mixture) refers to a polymerizable material may be added together with any other component of polymeric material to produce a polymerized product. 在一些实施例中，使用热引发剂。  In some embodiments, thermal initiators are used. 根据所用的具体聚合方法，热引发剂可以为水溶性或水不溶性的（即，油溶性的)。 Depending on the polymerization process used, a thermal initiator may be water soluble or water insoluble (i.e. oil-soluble). 合适的水溶性引发剂包括但不限于，过硫酸盐诸如过硫酸钾、过硫酸铵、过硫酸钠以及它们的混合物；氧化-还原引发剂诸如过硫酸盐与还原剂的反应产物，所述还原剂诸如偏亚硫酸氢盐(例如，偏亚硫酸氢钠）或硫酸氢盐(例如，硫酸氢钠)； 或4, 4'-偶氮双（4-氰基戊酸）及其可溶性盐(例如，钠盐、钾盐)。 Suitable water-soluble initiators include but are not limited to, persulfates such as potassium persulfate, ammonium persulfate, sodium persulfate, and mixtures thereof; oxidation - reduction initiators such as the reaction product of sulphate over and the reducing agent, the reduction agents such as metabisulfite salts (e.g., potassium metabisulfite, sodium) or hydrogen sulfate (e.g., sodium bisulfate); or 4, 4'-azobis (4-cyanovaleric acid) and its soluble salts ( For example, sodium, potassium). 合适的油溶性引发剂包括但不限于，各种偶氮化合物诸如可以商品名VAZ0从Ε · I ·杜邦公司有限公司（Ε. I. DuPont (^恥!11〇1^8〇). )商购获得，其包括¥42067 (为2,2'-偶氮双（2-甲基丁腈)、¥42064，（为2,2'-偶氮双(异丁腈)、以及¥六2052 (为2,2'-偶氮双（2,4-二甲基戊腈）；以及各种过氧化物诸如过氧化苯甲酰、过氧化环己烷、过氧化月桂酰、以及它们的混合物。 Suitable oil-soluble initiators include but are not limited to, various azo compounds such as the trade name VAZ0 from Ε · I · Du Pont Co. (Ε. I. DuPont (^ shame! ^ 8〇 11〇1).) List commercially available, including ¥ 42067 (as 2,2'-azobis (2-methylbutyronitrile), ¥ 42064, (2,2'-azobis (isobutyronitrile), and six ¥ 2052 ( 2,2'-azobis (2,4-dimethylvaleronitrile); and various peroxides such as benzoyl peroxide, cyclohexane peroxide, lauroyl peroxide, and mixtures thereof. 在许多实施例中，使用光引发剂。  In many embodiments, the use of a photoinitiator. 一些示例性的光引发剂为安息香醚(例如安息香甲醚或安息香异丙醚）或取代的安息香醚(例如茴香偶姻甲醚)。 Some examples of photoinitiators are benzoin ethers (such as benzoin methyl ether or benzoin isopropyl ether) or a substituted benzoin ethers (such as anisoin methyl ether). 其它示例性的光引发剂为取代的苯乙酮，如2, 2-二乙氧基苯乙酮或2, 2-二甲氧基-2-苯基苯乙酮(可以商品名IRGACURE651从巴斯夫公司（BASF)(新泽西州弗洛勒姆帕克（Florham Park，NJ)商购获得， 或以商品名ESACURE KB-1从沙多玛公司（Sartomer)(宾夕法尼亚州的埃克斯顿（Exton， PA)商购获得。其它示例性的光引发剂为取代的α-酮醇，例如2-甲基-2-羟基苯丙酮、芳族磺酰氯(如2-萘磺酰氯)，以及光活性肟，例如1-苯基-1，2-丙二酮-2-(0-乙氧基羰基） 肟。其它合适的光引发剂包括，例如1-羟基环己基苯基酮（11^^1«184)、双（2,4,6-三甲基苯甲酰基）苯基氧化膦（IRGACURE819)、l-[4- (2-羟乙氧基）苯基]-2-羟基-2-甲基-1-丙烷-1-酮（IRGA⑶RE2959)、2-苄基-2-二甲基氨基-1- (4-吗啉代苯基）丁酮(IRGACURE369)、2-甲基-1-[4-(甲硫基）苯基]-2-吗啉代丙-1-酮（IRGACURE907)和2-羟基-2-甲基-1-苯基丙-1-酮（DAR0CUR Other exemplary photoinitiator is a substituted acetophenone such as 2,2-diethoxyacetophenone or 2,2-dimethoxy-2-phenylacetophenone (IRGACURE651 from BASF under the trade name the company (BASF) (Florham Park, New Jersey (Florham Park, NJ) are commercially available, or trade name ESACURE KB-1 from Sartomer company (Sartomer) (Pennsylvania Exton (Exton, PA ) are commercially available. other exemplary ketol photoinitiators α- agent is substituted, such as 2-methyl-2-hydroxypropiophenone, aromatic sulfonyl chlorides (such as 2-naphthalenesulfonyl chloride) and photoactive oximes, such as 1-phenyl-1,2-propanedione-2- (o-ethoxycarbonyl) oxime. other suitable photoinitiators include, for example, 1-hydroxycyclohexyl phenyl ketone (1 ^^ 11 «184 ), bis (2,4,6-trimethylbenzoyl) phenyl phosphine oxide (IRGACURE819), l- [4- (2- hydroxyethoxy) phenyl] -2-hydroxy-2-methyl 1-propane-1-one (IRGA⑶RE2959), 2- benzyl-2-methyl-1- (4-morpholinophenyl) butanone (IRGACURE369), 2- methyl-1- [4 - (methylthio) phenyl] -2-morpholino-propan-1-one (IRGACURE 907) and 2-methyl-1-phenyl-propan-1-one (DAR0CUR 1173)。 1173). 可聚合的混合物还可任选地包含链转移剂以控制所得的弹性体材料的分子量。  The polymerizable mixture may optionally further comprise a chain transfer agent to control molecular weight of the resultant elastomeric material. 可用的链转移剂的例子包括但不限于，四溴化碳、醇、硫醇如巯基乙酸异辛酯、以及它们的混合物。 Examples of useful chain transfer agents include but are not limited to, carbon tetrabromide, alcohols, mercaptans such as isooctyl thioglycolate, and mixtures thereof. 如果使用，则可聚合的混合物可包括以可聚合材料的总重量计，至多〇. 5重量的链转移剂。 If used, the polymerization mixture may be included to the total weight of the polymerizable material, the chain transfer agent billion up to 5 wt. 例如，可聚合混合物可包含〇. 01至〇. 5重量％、0. 05至0. 5重量％、或0. 05至0. 2重量％的链转移剂。 For example, the polymerizable mixture may comprise a square.% To 01 billion. 5 by weight, from 0.05 to 0.5 wt%, or 0.05 to 0.2 wt% chain transfer agent. 用于形成本发明多层PSA膜的一个或多个压敏粘合剂层的基于（甲基）丙烯酸的弹性体材料的可聚合混合物可包括有机溶剂或可不含或基本上不含有机溶剂。  PSA for forming a multilayer film of the present invention, one or more pressure sensitive adhesive layer may be based on a mixture of elastomeric material polymerizable (meth) acrylic acid may include an organic solvent or may be free or substantially free of solvent. 如本文所用，关于有机溶剂的术语"基本上不含"意指有机溶剂的存在量以可聚合混合物或可聚合材料的重量计，小于5重量％、小于4重量％、小于3重量％、小于2重量％、或小于1重量％。 As used herein, the term on the organic solvent "substantially free" means that the organic solvent is present in an amount by weight of polymerizable mixture or polymerizable material, less than 5%, less than 4 wt%, less than 3% by weight, less than 2 wt%, or less than 1 wt%. 如果可聚合混合物中包含有机溶剂，则所述量常常选择成提供期望的粘度。 If a polymerizable mixture comprising an organic solvent, the amount is often selected to provide the desired viscosity. 合适的有机溶剂的例子包括但不限于，甲醇、四氢呋喃、乙醇、异丙醇、庚烷、丙酮、甲基乙基酮、乙酸甲酯、乙酸乙酯、甲苯、二甲苯、和乙二醇烷基醚。 Examples of suitable organic solvents include, but are not limited to, methanol, tetrahydrofuran, ethanol, isopropanol, heptane, acetone, methyl ethyl ketone, methyl acetate, ethyl acetate, toluene, xylene, dioxane and ethylene glycol ether. 这些溶剂可以单独使用或作为它们的混合物使用。 These solvents may be used alone or as a mixture thereof alone. 基于（甲基）丙烯酸的弹性体材料可通过多种常规自由基聚合方法制备，所述方法包括溶液聚合、本体聚合（即，具有少量或不具有溶剂)、分散聚合、乳液聚合、以及悬浮聚合方法。  Based on the elastomeric material (meth) acrylic acid by a variety of conventional free radical polymerization methods, said method including solution polymerization, bulk polymerization (i.e., with or without a small amount of solvent), dispersion polymerization, emulsion polymerization, and a suspension polymerization process. 所用的特定方法可受最终压敏粘合剂组合物的应用的影响。 The particular method used can be influenced by the pressure-sensitive adhesive composition of the final application. 所得的基于（甲基） 丙烯酸的弹性体材料可以为无规或嵌段共聚物。 Based on the obtained (meth) acrylic elastomeric material may be a random or block copolymer. 为了可用作压敏粘合剂，弹性体材料通常具有在25°C下小于300, 000帕斯卡的储能模量。  To be used as a pressure-sensitive adhesive, generally elastomeric material having at 25 ° C for less than 300, a storage modulus of 000 Pascals. 基于（甲基）丙烯酸的弹性体材料的储能模量通常为在25°C下不大于200, 000帕斯卡，不大于100, 〇〇〇帕斯卡，不大于50, 000帕斯卡，或不大于25, 000帕斯卡。 Based on storage modulus elastomeric material of (meth) acrylic acid is generally at 25 ° C for not more than 200, 000 Pascal, no greater than 100, 〇〇〇 Pascal, not more than 50, 000 Pa, or not greater than 25, 000 Pascal. 例如，储能模量可以为在25°C下不大于10, 000帕斯卡，不大于9, 000帕斯卡，不大于8, 000帕斯卡，或不大于7, 500帕斯卡。 For example, the storage modulus may be not greater than at 25 ° C 10, 000 Pascal, not more than 9,000 pascals, not more than 8,000 pascals, or no more than 7, 500 pascal. 对于高性能压敏粘合剂而言，常常期望较低的储能模量。 For high-performance pressure-sensitive adhesives, the lower the storage modulus is often desired. 在一些实施例中，基于（甲基）丙烯酸的弹性体材料本身可用作压敏粘合剂。  In some embodiments, the elastomeric material based on (meth) acrylic pressure sensitive adhesive itself may be used. 在其它实施例中，可将一种或多种增粘剂、一种或多种增塑剂、或它们的混合物与弹性体材料组合。 In other embodiments, the one or more tackifiers, one or more plasticizers, material combinations or mixtures thereof with the elastomer. 常常添加增粘剂（即，增粘剂或增粘树脂）以及增塑剂（即，增塑剂）以调节Tg，调节储能模量，并改变压敏粘合剂的粘着性。 Often added tackifier (i.e., tackifying resin or tackifier) ​​and a plasticizer (i.e., plasticizers) to adjust a Tg of, adjusting the storage modulus, and changes the pressure sensitive adhesive tack. 通常将压敏粘合剂组合物中所包含的任何增粘剂选择成可与基于（甲基）丙烯酸的弹性体材料混溶。  Generally any tackifier in the pressure-sensitive adhesive composition may be selected to be included in an elastomeric material based on (meth) acrylic acid miscible. 可使用通常包含在常规压敏粘合剂组合物中的任何增粘剂。 It may be used typically comprise a conventional pressure sensitive adhesive composition of any tackifier. 固体或液体增粘剂均可加入。 Solid or liquid tackifiers can be added. 固体增粘剂通常具有10, 〇〇〇克/摩尔或更少的数均分子量（Μη)和约70Γ以上的软化点。 10 typically has a solid tackifier, 〇〇〇 g / mole or less of number average molecular weight (Μη) above the softening point of about 70Γ. 液体增粘剂为软化点为约0°C至约70Γ的粘性材料。 Liquid tackifier having a softening point of about 0 ° C to about 70Γ the viscous material. 合适的增粘树脂包括松香树脂，诸如松香酸和它们的衍生物(例如，松香酯）；萜烯树脂诸如多萜(例如，基于α-蒎烯的树脂，基于β-蒎烯的树脂，和基于苎烯的树脂）和芳族改性的多萜树脂(例如，苯酚改性的多萜树脂）；苯并呋喃-茚树脂；以及基于石油的烃树月旨，诸如基于C5的烃树脂、基于C9的烃树脂、基于C5/C9的烃树脂、和基于二环戊二烯的树月旨。  Suitable tackifying resins include rosin resins such as rosin acids and their derivatives (e.g., rosin esters); terpene resins, such as polyterpenes (e.g., pinene alpha] based resin, β- pinene resins, polyterpene resins, and limonene-based resin) and aromatic-modified (e.g., phenol-modified polyterpene resins); coumarone - indene resin; and a petroleum-based hydrocarbon resin month purpose, such as a C5-based hydrocarbon resins, hydrocarbon resins based on C9 based hydrocarbon resins C5 / C9, the month, and tree-based purpose of dicyclopentadiene. 如果加入，则可将这些增粘树脂氢化以降低它们对压敏粘合剂组合物的颜色贡献。 If added, these can be hydrogenated tackifying resins to reduce their contribution to the color of the pressure sensitive adhesive composition. 如果需要，可采用多种增粘剂的组合。 If desired, tackifiers may be employed in various combinations. 为松香酯的增粘剂是多种松香酸与醇的反应产物。  The rosin ester tackifier is a reaction product of a rosin acid with a variety of alcohols. 这些包括但不限于，松香酸的甲基酯、松香酸的三甘醇酯、松香酸的甘油酯、松香酸的季戊四醇酯。 These include, but are not limited to, methyl esters of rosin acids, triethylene glycol ester of rosin acids, rosin acid esters, pentaerythritol esters of rosin acid. 这些松香酯可以部分或完全氢化以改善稳定性并减少它们对压敏粘合剂组合物的颜色贡献。 These rosin esters may be partially or completely hydrogenated to improve stability and reduce their contribution to the color of the pressure sensitive adhesive composition. 松香树脂增粘剂可例如以商品名PERMALYN、STAYBELITE和F0RAL从伊士曼化工公司（Eastman Chemical Company)商购获得，以及以商品名NUR0Z和NUTAC从新港工业公司（Newport Industries) 商购获得。 Rosin resin tackifier available, for example under the trade name PERMALYN, STAYBELITE and F0RAL commercially available from Eastman Chemical Company (Eastman Chemical Company) business, as well as the trade name NUR0Z and NUTAC from Newport Industries (Newport Industries) is commercially available. 完全氢化的松香树脂可例如以商品名FORAL AX-E从伊士曼化工公司（Eastman Chemical Company)商购获得。 Fully hydrogenated rosin resins may be, for example, under the trade name FORAL AX-E commercially available from Eastman Chemical Company (Eastman Chemical Company) provider. 部分氢化的松香树脂可以商品名STAYBELITE-E从伊士曼化工公司（Eastman Chemical Company)商购获得。 Partially hydrogenated rosin resin is STAYBELITE-E tradename commercially available from Eastman Chemical Company (Eastman Chemical Company) provider. 为烃树脂的增粘剂可由各种基于石油的原料制备。  Preparation of starting material may be of various petroleum-based hydrocarbon resin tackifier. 这些原料可以为脂族烃类(主要是C5单体与存在的一些其它单体，诸如反式-1，3-戊二烯、顺式-1，3-戊二烯、2-甲基-2- 丁烯、二环戊二烯、环戊二烯，以及环戊烯的混合物)、芳族烃类(主要是C9单体与存在的一些其它单体，诸如乙烯基甲苯、二环戊二烯、茚、甲基苯乙烯、苯乙烯、和甲基茚的混合物)、或它们的混合物。 These materials can be aliphatic hydrocarbons (mainly C5 monomer and other monomers present, such as 1,3-pentadiene, cis-trans-1,3-pentadiene, 2-methyl - 2-butene, dicyclopentadiene, cyclopentadiene, and mixtures cyclopentene), aromatic hydrocarbons (mainly C9 monomers with other monomers present, such as vinyltoluene, dicyclopentadiene dienes, indene, methyl styrene, styrene, methyl indene and mixtures), or mixtures thereof. 衍生自C5单体的增粘剂称为基于C5的烃树脂，而衍生自C9单体的增粘剂称为基于C9的烃树脂。 C5 monomers derived from hydrocarbon-based tackifier resin referred to C5, and C9 are derived from monomers known as tackifiers C9 based hydrocarbon resins. 一些增粘剂衍生自C5和C9单体的混合物，或为基于C5 的烃增粘剂和基于C9的烃增粘剂的共混物。 Some tackifiers derived from a mixture of C5 monomers and C9 or C5 based hydrocarbon tackifier blend, and C9 based hydrocarbon tackifier. 这些增粘剂可被称为基于C5/C9的烃增粘剂。 These tackifiers may be referred to as a hydrocarbon-based tackifiers C5 / C9's. 这些树脂中任一种可部分或完全氢化以改善它们的颜色和热稳定性。 These resins may be either fully or partially hydrogenated to improve their thermal stability and color. 基于C5的烃树脂可以商品名PICC0TAC和EAST0TAC从伊士曼化工公司（Eastman Chemical Company)商购获得，以商品名WINGTACK从克雷威利公司（Cray Valley)商购获得，以商品名NEVTAC LX从内维尔化工公司（Neville Chemical Company)商购获得，以及以商品名HIK0REZ从可隆工业公司（Kolon Industries，Inc. )商购获得。  C5 based hydrocarbon resins available under the trade name PICC0TAC EAST0TAC and commercially available from Eastman Chemical Company (Eastman Chemical Company) commercially under the trade name WINGTACK commercially available from Cray Valley (Cray Valley) commercially under the trade name NEVTAC LX commercially available from Neville Chemical company (Neville Chemical company) business, as well as the trade name HIK0REZ from Kolon industries, Inc. (Kolon industries, Inc.) is commercially available. 基于C5的经树脂可以商品名EAST0TACK从伊士曼化工公司（Eastman Chemical)商购获得，其具有不同的氢化度。 C5 may be based on the resin EAST0TACK tradename commercially available from Eastman Chemical Company (Eastman Chemical) providers, having different degrees of hydrogenation. 基于C9 的烃树脂可以商品名PICC0、KRISTLEX、PLAST0LYN、PICC0TAC 和ENDEX 从伊士曼化工公司（Eastman Chemical Company)商购获得，以商品名N0RS0LENE从克雷威利公司（Cray Valley)商购获得，以商品名N0VAREZ从吕特格斯公司（Ruetgers Ν· V.)商购获得，以及以商品名HIK0TAC从可隆工业公司（Kolon Industries，Inc. )商购获得。  C9 based hydrocarbon resins available under the trade name PICC0, KRISTLEX, PLAST0LYN, PICC0TAC and ENDEX commercially available from Eastman Chemical Company (Eastman Chemical Company) commercially under the trade name N0RS0LENE from Cray Valley (Cray Valley) and Suppliers commercially available under the trade name N0VAREZ (Ruetgers Ν · V.) commercially available from Lvtegesi companies, as well as the trade name HIK0TAC from Kolon industries, Inc. (Kolon industries, Inc.) is commercially available. 这些树脂可以部分或完全氢化。 These resins may be partially or fully hydrogenated. 在氢化前，基于C9的烃树脂常常具有约40%的芳族，如由质子核磁共振所测量。 Prior to hydrogenation, aromatic about 40%, as measured based on C9 hydrocarbon resins usually having a proton nuclear magnetic resonance. 氢化的基于C9的烃树脂可例如以商品名REGALITE和REGALREX从伊士曼化工公司（Eastman Chemical Company)商购获得，其为50 至100% (例如50%、70%、90% 和100%)氢化的。 Hydrogenated hydrocarbon resins based on C9 may be, for example, the tradename and REGALITE REGALREX from Eastman Chemical Company (Eastman Chemical Company) are commercially available, which is 50 to 100% (e.g. 50%, 70%, 90% and 100%) hydrogenated. 部分氢化的树脂通常具有一些芳环。 Partially hydrogenated resins typically having a number of aromatic rings. 多种基于C5/C9的烃增粘剂可以商品名ARK0N从荒川株式会社（Arakawa)商购获得，以商品名QUINT0NE从吉翁株式会社（Zeon)商购获得，以商品名ESC0REZ从埃克森美孚化工公司（Exxon Mobile Chemical)商购获得，以及以商品名NURES和H-REZ从新港工业公司（Newport Industries)商购获得。  plurality of hydrocarbon-based tackifiers C5 / C9 may ARK0N tradename commercially available from Arakawa Corporation (Arakawa) commercially under the trade names commercially available from Zeon Corporation QUINT0NE (Zeon) commercially under the trade name from ESC0REZ Exxon Mobil Chemical company (Exxon Mobile Chemical) are commercially available, as well as the trade name NURES and H-REZ from Newport industries (Newport industries) is commercially available. 最常规的基于（甲基）丙烯酸的弹性体材料的高溶解度参数以及这些弹性体材料与许多增粘剂之间特定潜在相互作用的存在限制了适用于很多常规压敏粘合剂组合物中的增粘剂。  Most conventional based on the presence of specific potential interactions between the elastic high solubility parameter (meth) acrylic material and elastomeric material with many of these tackifiers limits applicable to many conventional pressure-sensitive adhesive composition the tackifier composition. 作为一类，认为基于C5的烃树脂和基于C9的烃树脂，并且特别是这些烃树脂的氢化形式不适合与最常规的基于（甲基）丙烯酸的弹性体材料一起使用。 As a class, hydrocarbon-based resins that C5 and C9 based hydrocarbon resins, and particularly the hydrogenated form of hydrocarbon resins based elastomer material is not suitable (meth) acrylic acid is used with most conventional. 即，在相对极性的常规的基于（甲基）丙烯酸的弹性体材料和非极性的氢化烃树脂增粘剂之间存在溶解度失配。 That is, the opposite polarity based on conventional elastomer material present between the (meth) acrylic acid and non-polar hydrogenated hydrocarbon resin tackifier solubility mismatch. 与常规基于（甲基）丙烯酸的弹性体材料相反，使用式（I)单体制备的基于（甲基）丙烯酸的弹性体材料具有比基于石油的树脂诸如基于C5的烃树脂、基于C9的烃树脂、 基于C5/C9的烃树脂，以及这些树脂中任一种的氢化形式更大的相容性。  Based on the elastomeric material with a conventional (meth) acrylic contrary, prepared using the formula (I) based on a monomer elastomeric material (meth) acrylic acid having a ratio of petroleum-based resins such as C5 based hydrocarbon resins based on C9 hydrocarbon resins, hydrocarbon resins based on C5 / C9, and any one of these resins form hydrogenated greater compatibility. 所得的压敏粘合剂能够显得澄清并且甚至在如70°C的温度下老化1周之后也能保持澄清。 The resulting pressure sensitive adhesive can be clear and appear even after 1 week of aging can remain clear at a temperature such as 70 ° C.
 基于溶解度考虑，松香酯增粘剂和选定的萜烯树脂诸如苯酚改性的萜烯和基于α-蒎烯的树脂在包含常规基于（甲基）丙烯酸的弹性体材料的压敏粘合剂组合物中表现良好。  Based on solubility considerations, rosin ester tackifiers and selected phenol-modified terpene resins such as terpene resins and α- pinene-based pressure-sensitive material comprises a conventional elastomer-based (meth) acrylate of adhesive composition performed well. 然而，一些问题仍然与使用这些增粘剂相关联。 However, some problems still associated with the use of these tackifiers. 例如，包含这些增粘剂的压敏粘合剂组合物常常变色或泛黄。 For example, the tackifier comprising a pressure-sensitive adhesive compositions often discoloration or yellowing. 黄色外观为在许多这些增粘剂中固有的不同黄色色调的直接结果。 Yellow appearance as the direct result of inherent in many of these tackifiers different shades of yellow. 在老化(例如，在70°C下持续1周）和暴露于光下时，即使在树脂的颜色等级较浅的情况下，这种变色也可变得甚至更显著。 Aging (e.g., at 70 ° C for 1 week), and when exposed to light, even in the lighter color grade of the resin case, this discoloration can become even more pronounced. 不具有增粘剂的基于（甲基）丙烯酸的压敏粘合剂通常具有优异的老化特性。 Having no tackifier based on (meth) acrylic pressure sensitive adhesives generally have excellent aging characteristics. 常常通过将增粘剂氢化而使黄色外观最小化，但是所得的氢化树脂常常不像它们的未氢化等同物那样可与常规基于（甲基）丙烯酸的弹性体相容。 Often the yellow appearance by minimizing tackifier hydrogenated, but often not the obtained hydrogenated resins thereof unhydrogenated equivalents as may be conventional elastomers based on (meth) acrylic acid compatible. 经增粘的包含常规基于（甲基）丙烯酸的弹性体材料的压敏粘合剂的还可出现混浊，展示了常规基于（甲基）丙烯酸的弹性体材料的特性透明性的损失。  The pressure-sensitive adhesive may be based on the turbidity of the elastomeric material of (meth) acrylic acid by conventional tackified comprising, showing the loss characteristics of a conventional elastomeric material based on (meth) acrylic acid transparency . 浑浊是增粘剂和弹性体材料的有限的相容性或不完全的相容性的指示。 Turbidity tackifier and limited compatibility elastomeric material or incomplete indication of compatibility. 降低的相容性可导致老化时粘合性能的劣化，如由粘性的损失或降低的剥离粘附性所证实。 Reduced compatibility can lead to deterioration in adhesive performance upon aging, as evidenced by a decrease or loss of tack peel adhesion. 在一些情况下，将增粘剂加入至具有丙烯酸类单体、聚合物、低聚物和它们的任何混合物的压敏粘合剂组合物中可为澄清的， 并显得可相容。 In some cases, addition of a tackifier to the pressure-sensitive adhesive composition having acrylic monomers, polymers, oligomers, and any mixture thereof can be clear and appear to be compatible. 然而，在除去溶剂、固化或老化之后，压敏粘合剂可变得浑浊，这指示增粘剂和常规基于（甲基）丙烯酸的弹性体材料之间的至少一些不相容性。 However, the solvent is removed, after curing or aging, the pressure-sensitive adhesive may become cloudy, this indicates that based on conventional tackifiers and at least some of the incompatibility between the elastomer material of (meth) acrylic acid. 除了经增粘的压敏粘合剂组合物的透明度和稳定性的这些损失之外，当在用于形成常规基于（甲基）丙烯酸的弹性体材料的聚合反应期间存在增粘剂时，可观察到其它有害效果。  In addition to these losses through the transparency and stability of tackified pressure-sensitive adhesive composition outside, when during the polymerization reaction for forming a conventional elastomeric material (meth) acrylic acid-based thickener is present when, other deleterious effects can be observed. 取决于增粘剂的结构，添加增粘剂的不良效果包括聚合反应的抑制或延迟，和/或(如果增粘剂充当链转移剂或链终止剂）最终聚合物结构的改变。 Depending on the structure of the tackifier, adverse effect of the addition of the tackifier include inhibiting or delaying the polymerization reaction, and / or changing the structure of the final polymer (acting as a tackifier if chain transfer agent or chain terminator). 这种效果可不利影响在这些增粘剂的存在下制得的弹性体材料的性能和稳定性。 This effect may adversely affect the performance and stability of the elastomeric material prepared in the presence of such tackifiers. 链终止也可导致不希望的高残余挥发性材料。 Chain termination can also result in undesirably high residual volatile materials. 可通过使用不具有烯键式不饱和基团的氢化的增粘剂来最小化或消除这些效果。 It may be used to eliminate or minimize these effects by using a hydrogenated tackifier having no ethylenically unsaturated group. 使用式（I)的（甲基）丙烯酸烷基酯形成的基于（甲基）丙烯酸的酯通常可与氢化的增粘剂相容（即，混溶)。  formula (I) are (meth) acrylate ester is formed based on (meth) acrylic acid is generally compatible with the hydrogenated tackifier (i.e., miscible). 氢化增粘剂可以为至少部分氢化的，以除去不是环结构中一部分的任何双键。 Hydrogenated tackifiers may be at least partially hydrogenated to remove any double bonds not part of the ring structure. 即，可将增粘剂氢化使得其至少不含烯键式不饱和键。 I.e., hydrogenated tackifiers such that it is free of at least an ethylenically unsaturated bond. 在一些实施例中，氢化的增粘剂具有不饱和的环结构。 In some embodiments, the hydrogenated tackifier having an unsaturated ring structure. 这些增粘剂仅部分氢化，并可包含例如芳环。 These tackifiers are only partially hydrogenated, for example, may contain an aromatic ring. 在其它实施例中，将不是环结构中一部分的任何双键加上环结构中双键的至少一些氢化。 In other embodiments, the double bond is not any part of the ring structure of at least some of the hydride plus double bond in the ring structure. 在其它实施例中，将增粘剂完全氢化，包括任何环结构。 In other embodiments, the tackifier fully hydrogenated, include any ring structures. 氢化的增粘剂可以为，例如氢化的萜烯树脂、 氢化的松香树脂、氢化的基于C5的烃树脂、氢化的基于C9的烃树脂、或它们的组合。 The tackifier may be hydrogenated, such as hydrogenated terpene resins, hydrogenated rosin resins, hydrocarbon resins based on hydrogenated C5 and C9 hydrocarbon resins based on hydrogenated, or a combination thereof. 使用用式（I)的丙烯酸烷基酯制得的弹性体材料更可与氢化的增粘剂相容，并且具体地讲，更可与完全氢化的增粘剂相容。  Using the formula (I) is an alkyl acrylate prepared elastomeric material more compatible with hydrogenated tackifiers, and in particular, may be more compatible with the tackifier fully hydrogenated. 与由丙烯酸(：8烷基酯制得的常规基于（甲基） 丙烯酸的弹性体材料相比，这些压敏粘合剂在70Γ下固化和/或老化1周之后，常常具有更高的透明度。更高的透明度趋于指示弹性体材料和增粘剂之间的改善的相容性。这种改善的相容性常常反应出改善的粘附强度(例如，如使用180度剥离强度所测量）和改善的剪切保持力。 And (an acrylic: After 8 alkyl esters obtained by a conventional elastomeric material based on (meth) acrylic acid as compared to these pressure-sensitive adhesives curing at 70Γ and / or 1 week of aging, often greater transparency higher transparency tends to indicate improved compatibility between the elastomeric material and a tackifier. this improved the compatibility of the reaction is often improved adhesion strength (e.g., such as the use of the 180 degree peel strength measured ), and improved shear holding power. 任何增粘剂的用量均可以为相对于100份的基于（甲基）丙烯酸的弹性体材料， 至多1〇〇份。  Any amount of the tackifier relative to 100 parts that can be based on (meth) acrylic elastomeric material, most 1〇〇 parts. 然而，优选使用较低量的增粘剂。 Preferably, however, lower amounts of tackifier. 例如，增粘剂的用量可以为至多50份、至多45份、至多40份、至多35份、或至多30份。 For example, the tackifier may be used in an amount of up to 50 parts, at most 45 parts, at most 40 parts up to 35 parts or up to 30 parts. 以100份基于（甲基）丙烯酸的弹性体材料计，增粘剂的量可以为例如在3至50份的范围内，在3. 5至45份的范围内，在4至40份的范围内，在4. 5至35份的范围内，或在5至30份的范围内。 Based on 100 parts of elastomeric material meter (meth) acrylic acid, the amount of the tackifier may be, for example, in the range of 3 to 50 parts, in the range of 3.5 to 45 parts, in the range of from 4 to 40 parts inside, in the range of 4.5 to 35 parts, or in the range of 5 to 30 parts. 可用于本发明多层PSA膜的一些压敏粘合剂组合物可包括一种或多种增塑剂。 Some pressure-sensitive adhesive composition  PSA may be a multilayer film of the invention may include one or more plasticizers. 通常可将增塑剂选择成可与组合物中的其它组分诸如（甲基）丙烯酸弹性体材料和任何任选的增粘剂相容（即，可混溶)。 The plasticizer may be generally selected to be such (meth) acrylate elastomeric material and any optional tackifier is compatible with the other components of the composition (i.e., miscible). 合适的增塑剂包括但不限于，各种聚亚烷基氧化物(例如聚环氧乙烷或环氧丙烷)、己二酸酯、甲酸酯、磷酸酯、苯甲酸酯、邻苯二甲酸酯、以及磺酰胺或环烷油。 Suitable plasticizers include, but are not limited to, a variety of polyalkylene oxide (e.g. polyethylene oxide or propylene oxide), adipate, formate, phosphate, benzoate, phthalic dicarboxylate, and sulfonamide or naphthenic oils. 在制备用于本发明多层PSA膜的一个或多个压敏粘合剂层的压敏粘合剂的一些方法中，将包含用于形成基于（甲基）丙烯酸的弹性体材料的单体的可聚合混合物部分聚合以使粘度增加至对应于浆料状材料的粘度。  In some methods of pressure sensitive adhesive or a pressure sensitive adhesive layer of a plurality of multilayer PSA films prepared according to the present invention, comprising an elastomeric material for forming a (meth) acrylic acid the polymerizable mixture monomers portion so that the viscosity is increased to correspond to the viscosity of the slurry-like material. 通常，将式（I)的（甲基）丙烯酸烷基酯单体和其它任选的一价单体与自由基聚合引发剂的一部分混合。 Typically, (meth) acrylate monomer of formula (I) and other optional monovalent monomer mixture with a radical polymerization initiator portion. 根据添加的引发剂类型，将混合物暴露于光化辐射或加热下，以使一价单体（即，具有单个烯键式不饱和基团的单体）部分聚合。 The type of initiator added, the mixture is exposed to actinic radiation or heat, to make a linked monomers (i.e., monomers having a single ethylenically unsaturated group) of partially polymerized. 然后，将交联剂和引发剂的任何残余部分加入浆料状部分聚合的材料中。 Then, the crosslinking agent and any residual part of the initiator added to the slurry-like portion of the polymeric material. 还可将任选的增粘剂和增塑剂与部分聚合的材料混合。 It may also be optionally a tackifier and a plasticizer material is mixed with the partially polymerized. 所得的混合物可更容易作为涂料组合物施涂到载体(例如，防粘衬垫）或另一层(例如，背衬层）上。 The resulting mixture can be more readily applied to a carrier (e.g., release liner) or another layer (e.g., the backing layer) on the composition as a coating. 然后，若存在光引发剂，则可将该涂布层暴露于光化辐射，或者，若存在热引发剂，则可将该涂布层暴露于热。 Then, when the presence of a photoinitiator, the coating layer may be exposed to actinic radiation, or, if there is a thermal initiator, the coating layer may be exposed to heat. 暴露于光化辐射或热导致涂料组合物中可聚合材料的进一步反应。 Exposure to actinic radiation or heat may lead to further reaction of the polymerizable material in the coating composition. 就构建本发明的多层PSA膜而言，PSA膜包含至少第一压敏粘合剂层和至少一个相对层。  Building on the multilayer film of the present invention in terms of PSA, PSA film comprising at least a first pressure sensitive adhesive layer and at least one opposing layer. 相对层可以为非粘性的背衬层或也可具有压敏粘合剂特性。 Relatively non-tacky layer may also have a backing layer or a pressure-sensitive adhesive properties. 在后者的实施例中， 相对层为第二压敏粘合剂层。 In the latter embodiment, the second opposing layer is a pressure sensitive adhesive layer. 然而，本发明不限于两层膜。  However, the present invention is not limited to the two films. 例如，本发明的多层PSA膜还可包含三个、四个、五个或甚至更多个叠加层。 For example, the multilayer PSA film of the invention may also comprise three, four, five or even more superimposed layers. 在此类实施例中，还优选最外层为第一和第二压敏粘合剂层。 In such embodiments, the outermost layer preferably also the first and second pressure sensitive adhesive layer. 夹持在其中的层被称为中间层。 Which is sandwiched a layer called an intermediate layer. 换句话讲，在此类实施例中，所述多层膜包含介于第一压敏粘合剂层和第二压敏粘合剂层之间的至少一个中间层。 In other words, in such embodiments, the multilayer film comprises at least one intermediate layer interposed between the first pressure sensitive adhesive layer and second pressure-sensitive adhesive layer. 第二压敏粘合剂层的组合物可从任何已知的PSA体系中选择。  second pressure-sensitive adhesive composition layer may be selected from any known PSA system. 具体地，相对层和/或中间层包含选自由以下组成的组的聚合物：聚丙烯酸酯、聚氨酯、聚烯烃、聚苯乙烯、天然橡胶、合成橡胶、聚乙烯吡咯烷酮、以及它们的组合或混合物。 Specifically, the polymer component, the relative layer and / or the intermediate layer comprises material selected from the group consisting of: polyacrylates, polyurethanes, polyolefins, polystyrenes, natural rubber, synthetic rubber, polyvinyl pyrrolidone, and combinations or mixtures thereof . 然而，还可能的是相对层和/或一个或多个中间层从用于第一PSA层的如本发明所述的压敏粘合剂组合物中选择。  However, it is also possible relative layer and / or one or more intermediate layers selected from a first PSA layer according to the present invention as the pressure-sensitive adhesive composition. 与第一压敏粘合剂层相比，第二压敏粘合剂层的配方可以相同或不同。 Compared with the first pressure-sensitive adhesive layer, the pressure-sensitive adhesive layer, a second formulation can be the same or different. 除了上文所列的那些材料之外，相对层和/或中间层可包含或由背衬膜组成。  In addition to those materials listed above, the relative layer and / or the intermediate layer may comprise or consist of a backing film. 合适的背衬膜可由塑料(例如聚丙烯(包括双轴取向的聚丙烯)、乙烯基、聚乙烯、聚酯(如聚对苯二甲酸乙二醇酯)）、非织造物(例如纸、布、非织造稀松布)、金属箱、泡沫(例如聚丙烯酸类、聚乙烯、聚氨酯、氯丁橡胶）等制成。 Suitable backing film may be made of plastic (e.g., polypropylene (including biaxially oriented polypropylene), vinyl, polyethylene, polyester (e.g., polyethylene terephthalate)), nonwovens (e.g. paper, cloth, nonwoven scrims), metal boxes, foams (e.g., polyacrylic, polyethylene, polyurethane, neoprene) or the like. 泡沫可购自各种供应商，如Voltek，SekiSUi的3M 公司（3M Co.，Voltek, Sekisui)和其他。 Foams are commercially available from various suppliers, such as Voltek, SekiSUi 3M Company (3M Co., Voltek, Sekisui) and others. 泡沫可形成为在泡沫的一面或两面上与压敏粘合剂组合物共挤出的薄片，或者可将压敏粘合剂组合物层压于其上。 Foam may be formed on one or both sides of the foam pressure sensitive adhesive composition and a coextruded sheet, or a pressure sensitive adhesive composition may be laminated thereon. 当将压敏粘合剂层压在基底上时，可能期望处理基底的表面以改善粘附性。 When the pressure-sensitive adhesive laminated on a substrate at, the processing surface of the substrate may be desirable to improve adhesion. 这种处理通常基于粘合剂的材料的性质和基底的性质进行选择，并包括底漆和表面改性(例如电晕处理、表面磨损)。 Such treatment is typically selected based on the nature and properties of the substrate material adhesive, and including primers and surface modifications (e.g., corona treatment, surface abrasion). 就单面多层PSA膜而言，与第一压敏粘合剂层相对的相对层表面侧通常涂覆有合适的剥离材料。  PSA on one surface of the multilayer film, the opposite side of the opposing surface of the first layer is generally coated with a suitable pressure sensitive adhesive layer of the release material. 剥离材料是已知的，并包括诸如有机硅、聚乙烯、聚氨基甲酸酯、聚丙烯酸类等的材料。 Release materials are known and include materials such as silicone, polyethylene, polyurethane, polyacrylic acids and the like. 如上所述，本发明多层PSA膜的至少一个相对层包含至少一种填充材料。  As described above, the multilayer PSA film of the invention comprises at least one layer relative to the at least one filler material. 优选地， 用于本文的填充材料选自：填料颗粒、微球、可膨胀微球，优选地戊烷填充的可膨胀微球或气体腔室、玻璃珠、玻璃微球、疏水性二氧化硅型填料、亲水性二氧化硅型填料、纤维、导电和/或导热颗粒、纳米颗粒、以及它们的任何组合或混合物。 Preferably, the filler used herein is selected from: filler particles, microspheres, expandable microspheres, preferably pentane expandable microspheres may be filled or the gas chamber, glass beads, glass microspheres, hydrophobic silica type fillers, hydrophilic silica type fillers, fibers, electrically and / or thermally conductive particles, nanoparticles, and any combinations or mixtures thereof. 更优选地，用于本文的填充材料包含膨胀珍珠岩颗粒。 More preferably, the filler material for use herein comprise expanded perlite particles. 在根据本发明的多层PSA膜的另一实施例中，第一压敏粘合剂层和/或中间层可任选地包含至少一种填充材料，所述填充材料优选地选自：填料颗粒、微球、可膨胀微球，优选地戊烷填充的可膨胀微球或气体腔室、玻璃珠、玻璃微球、疏水性二氧化硅型填料、亲水性二氧化硅型填料、纤维、导电和/或导热颗粒、纳米颗粒、以及它们的任何组合；并且其中所述中间层优选地包含硅酸铝，更优选地膨胀珍珠岩。  In another PSA multilayer film according to the present embodiment of the invention, the first pressure-sensitive adhesive layer and / or the intermediate layer may optionally comprise at least one filler material, the filler material is preferably selected from from: filler particles, microspheres, expandable microspheres, preferably pentane expandable microspheres may be filled or the gas chamber, glass beads, glass microspheres, hydrophobic silica-type fillers, hydrophilic silica type fillers, fibers, electrically and / or thermally conductive particles, nanoparticles, and any combination thereof; and wherein said intermediate layer preferably comprises aluminum, and more preferably expanded perlite. 可使用此类填料以增加PSA膜的机械稳定性并还可增加抗剪切力和抗剥离力。 Such fillers may be used to increase the mechanical stability of the PSA film, and also increase the shear strength and peel strength. 从上述填料颗粒中，特别优选膨胀珍珠岩。  From the above-described filler particles, particularly preferably expanded perlite. 珍珠岩是天然存在的通过改变黑曜石而形成的水合火山玻璃。 Perlite is a naturally occurring hydrated volcanic glass formed by changing obsidian. 通常，珍珠岩由二氧化硅（70 - 75重量％)、氧化铝（12 - 17重量％)、氧化钠（3 - 4重量％)、氧化钾（3 - 5重量％)、氧化铁（0. 5 - 2重量％)、氧化镁（0. 2 - 〇. 7重量％)、和氧化钙（0. 5 - 1. 5重量％)组成。 Typically, Perlite silicon dioxide (70--75% by weight), alumina (12--17% by weight), sodium oxide (3 - 4 wt%), potassium (3 - 5% by weight), iron (0 . 5 - 2% by weight), magnesia (0.2 - 7 wt% square), and calcium oxide (0. 5 - 1.5 wt%) composition. 天然珍珠岩还包含约3 - 5重量％水。 Natural perlite further comprises from about 3--5% by weight of water. 使用于本发明的珍珠岩膨胀以在材料中获得极低密度的气泡，这因为水在原料珍珠岩中的存在而完成。  for use in the present invention the perlite is expanded to obtain a very low density gas bubbles in the material, since the water present in the feed which perlite is completed. 在加速加热至高于870°C时，原料珍珠岩以类似于爆米花的方式起泡，因为玻璃矿颗粒在火焰中软化并且矿中的水转化成蒸汽并膨胀，从而形成前述提及的多个低密度气泡。 When acceleration is heated to above 870 ° C, in a manner similar to popcorn Perlite foaming, since the glass softening ore particles in the flame and the water is transformed into steam mine and expanded, thereby forming a plurality of the mentioned low-density bubble. 已知该方法用于使珍珠岩膨胀。 The known method for expanding perlite. 在本发明中，膨胀珍珠岩以颗粒形式使用，然而膨胀珍珠岩颗粒具有1 - 300 μ m， 具体地讲10 - 150 μ m的平均直径。  In the present invention, in particulate form expanded perlite, expanded perlite particles but having 1 - 300 μ m, particularly 10 - 150 μ m of average diameter. 该尺寸的膨胀珍珠岩颗粒可购自市场，并可通过将由如上所述加热处理珍珠岩而获得的膨胀珍珠岩压碎而制得。 Expanded perlite particles of this size are available from the market, and can be expanded by heating the perlite by a process as described above is obtained crushed perlite prepared. 可添加到多层压敏粘合剂膜的任一层中的膨胀珍珠岩量可在宽范围内变化。 Amount of expanded perlite  the pressure-sensitive adhesive may be added to the multilayer film of any layer can vary within a wide range. 特别是如果这些层不具有PSA特性，则特别优选将膨胀珍珠岩加入相对层和/或中间层中。 Particularly if the layers do not have PSA properties, it is particularly preferably added to the expanded perlite opposing layers and / or intermediate layer. 具体地讲，相对于背衬层的组合物，膨胀珍珠岩含量可在1 - 30重量％，具体地将2 - 20重量％ 的范围内。 Specifically, with respect to the backing layer of the composition, the expanded perlite content may be 1 - 30 wt%, will be specifically 2 - 20 wt% of the range. 然而，本发明不限于前述范围。 However, the present invention is not limited to the aforementioned range. 在背衬层中具有此类内容物的多层PSA膜表现出特别高的剥离粘附力，尤其是对清漆涂层表面而言。 The multilayer PSA film having such contents in the backing layer exhibits a particularly high peel adhesion, especially for coating the surface of the varnish. 如上所述，膨胀珍珠岩为多孔材料。  As described above, the porous material is expanded perlite. 孔隙率确保了此类填充材料的添加不增加PSA 膜的总体重量，而是甚至相反可减少总体重量。 Such porosity ensures adding filler without increasing the overall weight of the PSA film, but instead may even reduce the overall weight. 从而，优选所用的膨胀珍珠岩具有680至850mL/100g的压实密度。 Thus, the expanded perlite is preferably used with a compacting density of 680 to 850mL / 100g of. 在本文中，还优选用于本文的膨胀珍珠岩颗粒表现出表面改性，其优选地选自疏水性表面改性如硅烷表面改性，和/或亲水性改性如环氧化、胺化或丙烯酸酯官能化。  Herein, it is also preferable for the expanded perlite particles herein exhibit surface-modified, preferably selected from hydrophobic surface modification such as a silane surface modification and / or hydrophilic modifiers such as ethylene , amination or acrylate functionalized. 不受理论的束缚，据信疏水性改性进一步增强例如对玻璃表面的粘附性，并还可导致聚合物基质和填料之间的弱相互作用，并因此改善粘合剂的可变形性。 Without being bound by theory, it is believed that hydrophobic modification example further enhanced adhesion to the glass surface, and may also lead to weak interaction between the filler and the polymer matrix, and thus improve the adhesive properties may be modified. 仍不受理论的束缚，据信这种效果导致粘合剂层中的更好的应力分布，从而导致对附着表面而言特别重要的改善的剥离性能。 Still not bound by theory, it is believed that this effect results in the adhesive layer better stress distribution, resulting in the release properties of particular importance for an improved attachment surface. 亲水性改性可用于改善对其中掺入填料的层的聚合物基质的粘附性。 Hydrophilic modification can be used to improve adhesion of the filler-layer wherein the polymer matrix. 环氧化、胺化和丙烯酸酯官能化可通过与例如与氨基硅烷、环氧基硅烷、以及丙烯酸硅烷反应来实现。 Epoxidation, amination and acrylate-functional can be achieved by, for example, aminosilane, epoxysilane, acrylic silane and with. 在第一压敏粘合剂层、相对层和/或中间层中可包括其它添加剂，以改变它们的相应性能。  In a first pressure sensitive adhesive layer, opposing layers and / or intermediate layer may include other additives to alter their respective performance. 此类添加剂，包括颜料、增粘剂、增韧剂、增强剂、阻燃剂、抗氧化剂和稳定剂。 Such additives, include pigments, tackifiers, tougheners, reinforcing agents, flame retardants, antioxidants and stabilizers. 以足够的量加入添加剂以获得所需的最终特性。 Additive is added in an amount sufficient to obtain the desired final characteristics. 根据本发明的另一优选的实施例，多层PSA膜设置在具有防粘衬垫的至少一个主要表面上。  According to another preferred embodiment of the present invention, the multilayer PSA film having disposed on at least one major surface of the release liner. 作为防粘衬垫，可使用本领域技术人员已知的任何合适的材料，如硅化纸、硅化聚合物膜材料，具体地硅化PET-膜。 As release liner, any suitable materials known to the skilled person, such as a siliconized paper, siliconized polymeric film material, particularly PET- silicide film. -个或多个压敏粘合剂层、相对层和中间层的厚度可在宽范围内变化。  - one or more pressure sensitive adhesive layer, and the layer thickness of the intermediate layer can vary within a relatively wide range. 例如，每个层的厚度可独立地选择在介于25 μ m至3, 000 μ m之间，更优选地介于75 μ m至2, 000 μ m 之间，特别优选介于75 μ m至1，500 μ m之间。 For example, the thickness of each layer may be selected independently of between 25 μ m to 3, 000 μ m, more preferably between 75 μ m to 2, 000 μ m range, particularly preferably between 75 μ m to between 1,500 μ m. 然而，优选一个或多个压敏粘合剂层表现出与中间层和/或相对层相比，更小的厚度。 Preferably, however, the one or more pressure sensitive adhesive layer exhibits a smaller thickness of the intermediate layer and / or the layer relative comparison. 例如，PSA层的厚度在20至200 μπι的范围内， 然而，认为相对层的厚度为800至2000 μ m。 For example, the thickness of the PSA layer is in the range of 20 to 200 μπι, however, that the relative thickness of the layer is 800 to 2000 μ m. 此类多层PSA膜表现出高剥离粘附性，这可能是由与PSA层相比，相对厚的相对层的稳定效应所造成的。 Such multilayer PSA film exhibits high peel adhesion properties, which may be compared to a PSA layer, a relatively thick layer of relatively stabilizing effect caused. 本发明还涉及制造根据本发明的一个方面的多层压敏粘合剂膜的方法，从而使第一压敏粘合剂层和相对层叠加在彼此上。  The present invention further relates to a method for producing a multilayer pressure sensitive adhesive film according to an aspect of the present invention, so that the first pressure sensitive adhesive layer and the opposite layer over each other. 在该方法的一个实施例中，第一压敏粘合剂层和相对层-如果需要，一个或多个中间层可单独制备并随后层压到彼此上。  In one embodiment of the method, the first pressure-sensitive adhesive layer and the opposite layers - if desired, one or more intermediate layers may be individually prepared and then laminated to each other. 在制造根据本发明的多层压敏粘合剂膜的可供选择的方法中，将第一压敏粘合剂层的液体前体和相对层的液体前体，以及如果需要还有一个或多个中间层叠加并然后固化，具体地用光化辐射诸如UV辐射、γ (伽马)辐射或电子束辐射或通过热固化来进行。  In an alternative method of manufacturing the multilayer pressure sensitive adhesive film of the present invention, the liquid precursor liquid precursor of the first pressure sensitive adhesive layer and the opposite layer, and if desired one or more intermediate laminate is then added and cured, in particular actinic radiation such as UV radiation, gamma] (gamma) radiation or electron beam radiation or by thermally curing. 该方法具体地描述于W02011094385 (Α1)中，其内容以引用方式并入本文。 The method particularly described in W02011094385 (Α1), the contents of which are incorporated herein by reference. 然而，本发明多层膜的制备不限于前述方法。  However, the preparation of the multilayer film of the invention is not limited to the foregoing method. 例如，多层PSA膜可通过共挤出、基于溶剂的方法或它们的组合来制备。 For example, the multilayer PSA film by co-extrusion, to prepare a solvent-based or a combination thereof. 本发明还涉及根据本发明的多层压敏粘合剂膜的用途，其作为PSA膜用其第一压敏粘合剂层粘结到LSE基底表面，优选地清漆涂层表面上。  The present invention further relates to the use of the multilayer pressure sensitive adhesive film according to the present invention, which is bonded with a first pressure sensitive adhesive layer to the substrate surface as LSE PSA film, the surface of the coating is preferably a varnish . 如上所述，根据本发明的多层PSA膜尤其可用于形成对低表面能（LSE)基底的强粘结用于本文的低能量表面的例子包括但不限于选自下列的表面：聚烯烃表面，具体地讲聚丙烯和聚乙烯表面；热塑性聚烯烃表面；清漆涂层表面，具体地讲清漆涂层的漆表面；以及它们的任何组合。  As described above, the multilayer PSA film of the present invention are particularly useful for example of a low surface energy of a low surface energy (LSE) substrates used herein, a strong bond is formed following the selected surfaces include but are not limited to: polyolefin surfaces, in particular polypropylene and polyethylene surfaces; thermoplastic polyolefin surface; clearcoat surfaces, in particular painted surfaces clearcoat; and any combination thereof. 然而，即使多层压敏粘合剂膜良好地粘结至低表面能表面上，这些粘合剂膜的应用也不限于低表面能基底。  However, even if the multilayer pressure sensitive adhesive film bond well to low surface energy surfaces, the application of the adhesive film is not limited to low surface energy substrates. 根据本发明的多层压敏粘合剂膜通常良好地粘结至较高表面能基底，例如其它塑料、陶瓷(例如玻璃)、和金属上。 Usually bond well multilayer pressure-sensitive adhesive film of the present invention to higher surface energy substrates, for example, other plastics, ceramics (e.g. glass) and a metal. 其上可施用根据本发明的多层PSA膜的基底根据具体应用来选择。  which may be selected according to the administration application PSA film multilayer substrate according to the present invention. 例如，可将多层PSA膜施用至片材产品（例如装饰性图形和反光产品)、标签纸（label stock)和胶带背衬。 For example, the multilayer PSA film can be applied to sheeting products (e.g., decorative graphics and reflective products), label paper (label stock) and the tape backing. 另外，可将多层PSA膜直接施用至基底如汽车面板或玻璃窗上，使得另一基底或物体可附接到面板或窗上，具体地附接到清漆涂层表面上。 Further, the multilayer PSA film may be applied directly to a substrate such as a car panel or glazing, so that another substrate or object can be attached to a panel or window, particularly attached to the surface of the coating varnish. 其中至少一个相对层包含至少一种填充材料。  wherein the at least one opposing layer comprises at least one filler material. 项2为根据权利要求1所述的多层PSA膜，其中所述填充材料选自：填料颗粒、微球、可膨胀微球，优选地戊烷填充的可膨胀微球或气体腔室、玻璃珠、玻璃微球、疏水性二氧化硅型填料、亲水性二氧化硅型填料、纤维、导电和/或导热颗粒、纳米颗粒、以及它们的任何组合或混合物。  Item 2 is a multilayer PSA film according to claim 1, wherein the filler material is selected from: filler particles, microspheres, expandable microspheres, preferably pentane filled microspheres or expandable gas chamber chamber, glass beads, glass microspheres, hydrophobic silica-type fillers, hydrophilic silica type fillers, fibers, electrically and / or thermally conductive particles, nanoparticles, and any combinations or mixtures thereof. 更优选地，填充材料包含膨胀珍珠岩颗粒。 More preferably, the filler material comprises expanded perlite particles. 项3为根据项1或2所述的多层PSA膜，其中所述第一单体包含多个不同的式（I) 的（甲基）丙烯酸烷基酯。  Item 3 of the multilayer PSA film according to Item 1 or 2, wherein the first monomer comprises a plurality of different compound of formula (I) are (meth) acrylate. 项4为根据前述项中任一项所述的多层PSA膜，其中第一单体包含多个式（I)的结构异构体。  Item 4 multilayer PSA film is any one of the preceding items, wherein the first monomer comprises a plurality of formula (I) are structural isomers. 项5为根据前述项中任一项所述的多层PSA膜，其中每个R1具有17至21个碳原子。  Item 5 of the multilayer PSA film according to any one of the preceding items, wherein each of R1 having 17 to 21 carbon atoms. 项6为根据前述项中任一项所述的多层PSA膜，其中每个R1具有17个碳原子。  Item 6 is the multilayer PSA film according to any one of the preceding items, wherein each of R1 having 17 carbon atoms. 项7为根据前述项中任一项所述的多层PSA膜，其中所述第二单体选自：不为式(I)的非极性（甲基）丙烯酸酯、不具有（甲基）丙烯酰基团的非极性乙烯单体、极性单体、 交联剂、以及它们的任何组合或混合物。  one of the items 7 to a multilayer PSA film according to any preceding item, wherein said second monomer is selected from: nonpolar formula (I), (meth) acrylates, having (meth) acryloyl monomer apolar vinyl group, the polar monomer, crosslinking agent, and any combinations or mixtures thereof. 项8为根据项7所述的多层PSA膜，其中所述极性单体包含酸性基团、羟基、或含氮基团，其中所述酸性基团优选为羧基或它们的盐。  Item 8 is a multilayer PSA film according to item 7, wherein said polar monomer comprises an acidic group, a hydroxyl group, or a nitrogen-containing group, wherein the acidic group is preferably a carboxyl group or a salt thereof . 项9为根据前述项中任一项所述的多层PSA膜，其中第二单体包含强极性丙烯酸， 其优选地选自丙烯酸、甲基丙烯酸、衣康酸、羟烷基丙烯酸酯、丙烯酰胺和取代的丙烯酰胺， 以及它们的组合或混合物。  Item 9 as one of the multilayer PSA film according to any of the preceding items, wherein the second strongly polar monomer comprises acrylic acid, which is preferably selected from acrylic acid, methacrylic acid, itaconic acid, hydroxyalkyl acrylates, acrylamides and substituted acrylamides, and mixtures or combinations thereof. 项10为根据前述项中任一项所述的多层PSA膜，其中以可聚合材料的总重量计， 所述可聚合材料包含50至99. 5重量％的式（I)的（甲基）丙烯酸烷基酯和0. 5至50重量％的第二单体。  Item 10 is the preceding item multilayer film according to the PSA, wherein the total weight of polymerizable material, the polymeric material may comprise from 50 to 99.5% by weight of the formula (I), (meth) acrylic acid alkyl ester and 0.5 to 50 wt% of a second monomer. 项11为根据前述项中任一项所述的多层PSA膜，其中所述可聚合材料包含以可聚合材料的总重量计，至少50重量％的式（I)的（甲基）丙烯酸烷基酯和至多15重量％的极性单体。  Item 11 is a multilayer PSA film according to any one of the preceding items, wherein said polymeric material comprises on the total weight of the polymerizable material, at least 50% by weight of the formula (I), (meth ) alkyl acrylate and up to 15 wt% of a polar monomer. 项12为根据前述项中任一项所述的多层PSA膜，其中所述可聚合材料包含至少1 重量％的不是式（I)的非极性单体。 Non-polar monomers  Item 12 is the multilayer PSA film according to any one of the preceding items, wherein the polymerizable material comprises at least 1% by weight is not of formula (I) are. 项13为根据项9至12中任一项所述的多层PSA膜，其中所述可聚合材料包含以可聚合材料的总重量计，至多10重量％，优选地1至8重量％，更优选地2至6重量％的强极性丙烯酸酯。  Item 13 is a multilayer PSA film according to any one of Items 9 to 12, wherein said polymeric material comprises on the total weight of the polymerizable material, up to 10 wt%, preferably 1-8 wt. %, more preferably 2 to 6% by weight of the strongly polar acrylate. 项14为根据前述项中任一项所述的多层PSA膜，其中所述可聚合材料包含至多5 重量％的交联剂。  Item 14 is the multilayer PSA film according to any one of the preceding items, wherein said polymeric material comprises up to 5% by weight of a crosslinking agent. 项15为根据前述项中任一项所述的多层PSA膜，其中所述第一压敏粘合剂层还包含增粘剂，优选地每1〇〇份基于（甲基）丙烯酸的弹性体材料，3至50份增粘剂，更优选地每100份基于（甲基）丙烯酸的弹性体材料，5至30份增粘剂。  Item 15 is the preceding item multilayer film according to the PSA, wherein the first pressure-sensitive adhesive layer further comprises a tackifier, preferably based on (meth) parts per 1〇〇 acrylic elastomeric material, 3 to 50 parts of a tackifier, and more preferably per 100 parts of elastomeric material based on (meth) acrylic acid, 5 to 30 parts tackifier. 项16为根据项15的多层PSA膜，其中所述增粘剂选自基于C5的烃树脂、基于C9 的烃树脂、基于C5/C9的烃树脂，以及它们的任何组合或混合物。  Item 16 is the multilayer PSA film according to Item 15, wherein said tackifier is selected from C5 based hydrocarbon resins based on C9 hydrocarbon resins, and hydrocarbon resins based on C5 / C9, and any combinations or mixtures thereof . 项17为根据项15所述的多层PSA膜，其中所述增粘剂选自氢化萜烯树脂、氢化松香树脂、氢化的基于C5的烃树脂、氢化的基于C9的烃树脂、氢化的基于C5/C9的烃树脂、以及它们的组合或混合物。  Item 17 is the multilayer PSA film according to Item 15, wherein said tackifier is selected from hydrogenated terpene resins, hydrogenated rosin resins, hydrocarbon resins based on hydrogenated C5 and C9 hydrocarbon resins based on hydrogenated, and hydrocarbon resins based on C5 / C9, and combinations or mixtures thereof hydrogenated. 项18为根据前述项中任一项所述的多层PSA膜，其中所述相对层为第二压敏粘合剂层。  Item 18 is the multilayer PSA film according to any one of the preceding items, wherein the second opposing layer is a pressure sensitive adhesive layer. 项19为根据项18所述的多层PSA膜，其中所述多层膜包含介于第一压敏粘合剂层和第二压敏粘合剂层之间的至少一个中间层。  Item 19 is a multilayer PSA film according to Item 18, wherein the multilayer film comprises at least one intermediate layer between the first pressure sensitive adhesive layer and the second pressure sensitive adhesive layer is interposed . 项20为根据前述项中任一项所述的多层PSA膜，其中所述相对层和/或中间层包含聚合物基体材料，所述聚合物基体材料选自由以下组成的组：聚丙烯酸酯、聚氨酯、聚烯烃、聚苯乙烯、天然橡胶、合成橡胶、聚乙烯吡咯烷酮、以及它们的组合或混合物。  Item 20 is a multilayer PSA film according to any one of the preceding items, wherein said opposing layers and / or the intermediate layer comprises a polymer matrix material, said polymeric matrix material is selected from the group consisting of: polyacrylates, polyurethanes, polyolefins, polystyrenes, natural rubber, synthetic rubber, polyvinyl pyrrolidone, and combinations or mixtures thereof. 项21为根据前述项中任一项所述的多层PSA膜，其中用于形成相对层和/或中间层的聚合物基体材料的可聚合前体包含（甲基）丙烯酸2-辛酯，其中所述可聚合前体优选地包含85至99. 5重量％，更优选地90至99. 5重量％的（甲基）丙烯酸2-辛酯（以用于形成相对层的可聚合基体材料的总重量计)。  Item 21 is a multilayer PSA film according to any one of the preceding items, wherein for forming the opposing layers and / or polymeric precursor polymer matrix material of the intermediate layer comprises a (meth) acrylate, 2 octyl, wherein said polymeric precursor preferably comprises 85 to 99.5 wt%, more preferably from 90 to 99.5% by weight of (meth) acrylate, octyl (for forming the layer may be relatively the total weight of the polymeric matrix material basis). 项22为前述项中任一项所述的多层PSA膜，其中可聚合材料和/或用于形成相对层和/或中间层的聚合物基体材料的可聚合前体至少部分地衍生自生物材料，优选地植物材料，其中至少25重量％，优选地至少40重量％的可聚合材料和/或用于形成相对层和/ 或中间层的聚合物基体材料的可聚合前体优选衍生自生物材料。  Item 22 is the entry in the multilayer PSA film according to any preceding claim, wherein the polymeric material and / or a layer for forming the opposing and / or polymeric precursor polymer matrix material of the intermediate layer is at least partially derived from a biological material, preferably plant material, wherein at least 25 wt%, preferably at least 40% by weight of polymeric material and / or for forming opposing layers and / or polymer matrix material may be polymeric precursor intermediate layer is preferably derived from a biological material. 项23为根据项21或22中任一项所述的多层PSA膜，其中（甲基）丙烯酸2-辛基酯整体衍生自生物材料。  Item 23 according to item 21 or 22 in the multilayer PSA film according to any preceding claim, wherein the (meth) acrylate, 2-octyl acrylate is derived from the entire biomaterial. 项24为根据项中任一项所述的多层PSA膜，其中所述第一压敏粘合剂层、相对层和/或中间层包含至少一种填充材料，其优选地选自填料颗粒、微球、可膨胀微球，优选地戊烷填充的可膨胀微球或气体腔室、玻璃珠、玻璃微球、疏水性二氧化硅型填料、亲水性二氧化硅型填料、纤维、导电和/或导热颗粒、纳米颗粒、以及它们的任何组合；并且其中所述中间层优选地包含硅酸铝，更优选地膨胀珍珠岩。  Item 24 is a multilayer PSA film according to any one of the items, wherein the first pressure sensitive adhesive layer, opposing layers and / or intermediate layer comprises at least one filler material, which is preferably selected from since the filler particles, microspheres, expandable microspheres, preferably pentane expandable microspheres may be filled or the gas chamber, glass beads, glass microspheres, hydrophobic silica-type fillers, hydrophilic silica type filler , fibers, electrically and / or thermally conductive particles, nanoparticles, and any combination thereof; and wherein said intermediate layer preferably comprises aluminum, and more preferably expanded perlite. 项25为根据项24所述的多层PSA膜，其中所述膨胀珍珠岩颗粒表现出表面改性， 所述表面改性优选地选自疏水性表面改性和/或亲水性表面改性。  Item 25 is a multilayer PSA film according to item 24, wherein the expanded perlite particles exhibit a surface modification, said surface modification is preferably selected from hydrophobic surface modification and / or hydrophilic surface modification. 优选的疏水性表面改性包括硅烷表面改性。 Preferred hydrophobic surface modification comprises a surface-modified silane. 优选的亲水性改性包括环氧化、胺化和/或丙烯酸酯官能化。 Preferred hydrophilic modifiers include epoxidized, aminated and / or acrylate-functional. 项26为根据前述项中任一项所述的多层PSA膜，其中所述PSA膜设置在具有防粘衬垫的至少一个主表面上。 26 is a multilayer PSA film according to any one of the preceding items, wherein the PSA film having a release liner disposed on at least one major surface of the  items. 项27为用于制造根据项1至26中任一项所述的多层压敏粘合剂膜的方法，从而使所述第一压敏粘合剂层和所述相对层叠加在彼此上。  The method of item 27 for 1 to 26 items multilayer pressure sensitive adhesive film according to one of the manufacturing, so that the pressure-sensitive adhesive layer and the first opposing layer superposed on each other. 项28为根据项27所述的方法，其中所述第一压敏粘合剂层和相对层单独制备并随后彼此层压。  Item 28, wherein the first pressure sensitive adhesive layer and the opposite layers prepared separately method according to item 27 and then laminated to each other. 项29为根据项27所述的方法，其中将第一压敏粘合剂层的液体前体和相对层的液体前体叠加并然后优选地用光化辐射或通过热固化来进行固化。  Item 29 The method of item 27, wherein the precursor liquid in the liquid precursor of the first overlay pressure sensitive adhesive layer and the opposite layer and then preferably actinic radiation or by thermal curing cured. 优选的光化辐射包括UV 福射、y (伽马）福射、和电子束福射。 Preferred actinic radiation comprises emitting UV-fu, y (gamma) radiation, to electron beam emitted blessing. 项30为根据项1至26中任一项所述的多层压敏粘合剂膜的用途，其作为PSA膜用其第一压敏粘合剂层粘结至LSE基底表面，优选地清漆涂层表面。  Item 30 to Item 1 to 26 The use of any one of the multilayer pressure-sensitive adhesive film, which is bonded to the substrate surface LSE with a first pressure sensitive adhesive layer according to a PSA film, preferably, the clear coat surface. 本发明用以下实例更具体地解释。  The present invention is more specifically explained by the following examples. 自样品材料中纵向切出宽度为10mm且长度为>175mm的根本发明的压敏粘合剂膜的条。  Since the sample material was cut out longitudinal width of 10mm and a length of> 175mm strip of pressure sensitive adhesive film of the underlying invention. 对于试验样本制备而言，首先将衬垫从每个PSA膜条的粘合剂涂覆面中除去，然后使用轻微的指压粘合剂面向下而置于干净的测试面板上。  For the purposes of preparing the test sample, the liner is first removed from the adhesive-coated surface of each PSA film strip, then a slight finger pressure while the adhesive is placed face down on a clean test panels. 接着，以大约1〇_/秒的速度用标准FINAT测试辊(重6, 8kg)将试验样本在各方向上乳制两次，以获得粘合剂物质和表面之间的紧密接触。 Subsequently, at a rate of about 1〇_ / sec with a standard FINAT test roller (weight 6, 8kg) test sample dairy twice in each direction, to obtain intimate contact between the adhesive material and surface. 在将压敏粘合剂膜条施用到测试面板之后，在测试前，允许试验样本在环境室温（23°C +/_2°C，50%相对湿度+/-5%)下保压24小时。 After administration of the pressure sensitive adhesive film strip to the test panel before testing, allowing the test sample at ambient room temperature (23 ° C + / _ 2 ° C, 50% +/- 5% relative humidity) for 24 hours dwell . 对于剥离测试而言，在第一步中将试验样本夹持在Zwick拉伸试验机(型号Z020， 可从德国乌尔姆的兹维克/罗尔有限公司（Zwick/Roell GmbH，Ulm，Germany)商购获得）的下部可活动夹具中。  For the peel test, the test sample holder in a first step a tensile tester (at a Zwick Model Z020, Ulm, Germany from Zwick / Roell Co. (Zwick / Roell GmbH, the lower part of Ulm, Germany) commercially available) is movable fixture. 将压敏粘结剂膜条以90°的角度折回，并将其自由端以常用于90°测量的构型在拉伸试验机的上夹具中抓紧。 The pressure sensitive adhesive film strip folded back at an angle of 90 °, and the free end thereof to 90 ° commonly used in the measurement configuration grip on the jig of a tensile tester. 将拉伸试验机设定成300mm/分钟的夹具分离速率。 The tensile testing machine set to a grip separation rate of 300mm / min. 测试结果以牛顿每l〇mm (N/10mm)表示。 Test results are expressed in Newtons per l〇mm (N / 10mm). 引述的剥离值为四次90°剥离测量的平均值。 It cited four 90 ° peel value of the average peel measurements. 静态剪切为粘合剂的内聚性或内部强度的量度。  static shearing the cohesive or internal strength measure adhesive. 其以在恒定的标准载荷应力下从不锈钢测试面板拉下标准面积的粘合剂片状材料所需的时间(分钟）为单位量度。 The time it needs to load a standard under constant stress pull a standard area of ​​adhesive from a stainless steel test panel sheet material (minutes) for the unit of measurement. 从样品中纵向切出10mm宽且20mm长的PSA膜条。  longitudinal cut out from the sample 20mm long and 10mm wide PSA film strip. 然后除去一个附接的表面衬垫， 并放置样品，其中期望的泡沫侧在铝背衬上。 Attaching a surface of the pad is then removed into contact, and the sample is placed, wherein the side of the desired aluminum foam backing. 然后移除第二防粘衬垫并将泡沫附接到测试基底(面板)，使用轻微的指压，提供20 X 10mm的粘结区域。 The second release liner was then removed and the foam is attached to a test substrate (panel), using slight finger pressure, providing an adhesive area 20 X 10mm. 以大约10mm/秒的速度在各方向上将标准FINAT测试辊(重6, 8kg)乳制两次，以获得粘合剂物质和基底表面(测试面板） 之间的紧密接触。 Close contact with a speed of approximately 10mm / sec in each direction standard FINAT test roller (weight 6, 8kg) dairy twice to obtain an adhesive material and the substrate surface (panel test) between. 在将泡沫条(样品)施用到测试面板之后，在测试之前，允许测试面板在室温（23°C +/_2°C，50%相对湿度+/-5%)下持续一段24小时的保压时间。 After the foam strip (sample) applied to the test panel before testing at room temperature to allow test panels (23 ° C + / _ 2 ° C, 50% +/- 5% relative humidity) for a period of 24 hours dwell time. 然后，将测试面板置于剪切保持装置中。  Then, the test panels were placed in shear holding means. 在10分钟保压时间之后，在70°C (对于Uregloss而言）和90°C (对于VW-2K而言）的测试温度下，将500g载荷吊挂入测试面板的孔中。 After 10 minutes dwell time at test temperature 70 ° C (for Uregloss terms) and 90 ° C (for VW-2K terms) of the hanging-in hole 500g load test panel. 开始定时器。 Start timer. 结果以分钟为单位记录直至失效，并且为三次剪切测量的平均值。 Results are reported in minutes until failure, and the average of the three measurements of shear. " 10000+"的记录时间指示停止测试时，带材在10000分钟后不失效。 When "10000 +" recording time indication to stop testing, the strip does not fail 10,000 minutes. CeramiClear5 涂覆的面板，购自PPG 工业公司（PPG Industries)。  CeramiClear5 coated panel, available from PPG Industries, Inc. (PPG Industries). VW2K清漆涂层涂覆的面板，购自巴斯夫涂料公司（BASF coatings)。  VW2K clearcoat coated panel, available from BASF Coatings (BASF coatings). 上文所列的清漆涂层包括丙烯酸类树脂和聚酯，所述丙烯酸类树脂和聚酯单独地使用或与包含羟基或缩水甘油基官能团或氨基甲酸残基(基团）的共聚物；或具有羟基基团、游离酸基团的丙烯酸酯和甲基丙烯酸酯和另外的共聚单体(例如，苯乙烯）的共聚物的混合物一起使用。  The clearcoat listed above include acrylic resins and polyesters, the acrylic resin and the polyester used alone or containing hydroxyl groups or glycidyl functional copolymer or carbamate residue (group) used or copolymer mixtures having a hydroxyl group, a free acrylate and methacrylate and other comonomers acid groups (e.g., styrene); and was. 在90°剥离和剪切测试之前，将面板切割至要求的尺寸。 Before 90 ° peel and shear tests, the panels were cut to the required size. 测试之前，用异丙醇和蒸馏水的1:1混合物(在Uregloss和VW2K清漆涂层的情况下）或用正庚烧(对于CeramiClear5清漆涂层而言）清洁机动车清漆涂层涂覆的面板。  Prior to testing, using distilled water and isopropanol 1: 1 mixture (and in the case of Uregloss VW2K clearcoat) or with n-heptane to burn (for CeramiClear5 clearcoat) cleaning automotive clear coating is applied panel. 然后用纸巾将测试面板擦干。 Then wipe dry with a paper towel test panel. 丙烯酸异辛酯(丙烯酸C8-酯）为异辛醇和丙烯酸的酯，其得自希尔顿的工厂（Ι0Α Antwerp)。  isooctyl acrylate (C8- acrylate ester) iso-octyl acrylate and acrylic acid, which is available from Hilton plant (Ι0Α Antwerp). 丙烯酸-2-乙基己基酯(丙烯酸C8-酯)为2-乙基醇与丙烯酸的酯，其得自德国的巴斯夫股份公司（BASF AG，Germany)。  acrylate, 2-ethylhexyl acrylate (acrylic acid ester C8-) alcohol is 2-ethyl acrylate and acrylic acid, which is available from BASF Aktiengesellschaft of Germany (BASF AG, Germany). Tg 值：_58°C。 Tg values: _58 ° C.
 丙稀酸（AA)得自德国希尔顿的3M公司（3M Hilden，Germany)。  acrylic acid (AA) from Germany Hilton 3M Company (3M Hilden, Germany). N-乙烯基己内酰胺(德国的巴斯夫股份公司（BASF AG，Germany)为侧链中具有酰胺基的一官能丙烯酸类单体。  N- vinyl caprolactam (BASF AG, Germany (BASF AG, Germany) is a functional acrylic monomer having an amide group in the side chain. 二丙烯酸1，6-己二醇酯为快速固化的二丙烯酸酯并得自德国希尔顿的3M公司(3M Hi 1den，Germany)。  diacrylate, 1,6-hexanediol diacrylate as rapid curing and diacrylate available from 3M Company, Germany Hilton (3M Hi 1den, Germany). Omnirad BDK (荷兰的瓦尔维克的IGM 树脂公司（iGm resins，Waalwijk Netherlands) :2, 2-二甲氧基-2-苯基苯乙酮（UV-光引发剂）。  Omnirad BDK (Netherlands Val Wick IGM Resins (iGm resins, Waalwijk Netherlands): 2, 2- dimethoxy-2-phenylacetophenone (a UV-photoinitiator). Eurocell EC300_h (德国的Europerl 公司（Europerl，Germany))为娃酸错（也称为珍珠岩)。  Eurocell EC300_h (Germany Europerl company (Europerl, Germany)) for the wrong baby acid (also known as perlite). 可以不同粒度和表面改性获得，用于本文的为：EC300-h 粒度：75μπι，用硅烷疏水化。 Different particle size and surface modification may be obtained, as used herein: EC300-h particle size: 75μπι, hydrophobized with a silane. 3M Glassbubbles (K15)为直径为115 μπι 的中空玻璃泡。  3M Glassbubbles (K15) having a diameter of 115 μπι hollow glass bubbles. Regalite R-1125为低分子量的完全氢化的烃树脂，其可从荷兰的伊士曼化学公司（Eastman Chemical BV，NL)商购获得。  Regalite R-1125 is a fully hydrogenated hydrocarbon resin having a low molecular weight, which may be (, NL Eastman Chemical BV) commercially available from Eastman Chemical Company of the Netherlands. 用于实例的不同压敏粘合剂层由具体描述于W02011094385 (A1)中的方法通过如下步骤来制备：在包含作为光引发剂的0,04ppH Omnirad BDK的容器中，使丙烯酸C17酯和AA单体初始预聚，然后使混合物暴露在紫外辐射下直至获得粘度为约llOOOmPas (当用Brookfield粘度计测量时，T=25°C，锭子4,12rpm)的可固化衆料。  Examples of different pressure sensitive adhesive layer by the process described specifically in W02011094385 (A1) is prepared by the steps of: a container comprising 0,04ppH Omnirad BDK as a photoinitiator in the acrylic acid C17 ester monomers and initial prepolymer AA, then the mixture is exposed to ultraviolet radiation until a viscosity of about llOOOmPas (when measured with a viscometer Brookfield, T = 25 ° C, 4,12rpm spindle) public curable material. 在UV暴露之前，将混合物用氮气冲洗10分钟，并使氮气对混合物鼓泡直至通过向浆料中加入空气而使聚合过程停止。  Before UV exposure, and the mixture flushed with nitrogen for 10 minutes, and nitrogen was bubbled until the mixture by the addition of air to the slurry polymerization process is stopped. 始终都用螺旋桨式搅拌器（300U/min)搅拌混合物并且当粘度达到约llOOOmPas时停止反应。 Always with a propeller stirrer (300U / min) the mixture was stirred and reaction was stopped when the viscosity reached about llOOOmPas. 向衆料中加入一种或多种附加的共聚单体、Omnirad BDK、增粘剂和HDDA交联剂并混合直至其溶解。 Compound was added to all of one or more additional comonomers, Omnirad BDK, tackifier and crosslinking agent HDDA and mixed until dissolved. 然后用如W02011094385 (A1)所述的实验室涂布机将表层浆料以大约70-90 μ m的厚度涂覆到底部至填充芯。 Then as W02011094385 (A1) the laboratory coater skin slurry was applied in a thickness of about 70-90 μ m in the end portion to the bead core. 在75 μ m不含溶剂的硅化PET衬垫(尺寸为300mm X 300mm的SLVK-衬垫）上涂覆双层构造。 Siliconized PET liner solvent-free in 75 μ m (the size of 300mm X 300mm SLVK- liner) was coated on the layer structure. 泡沫的液体前体，下文中称为LPF，通过在玻璃容器中将90重量％2-EHA和10重量％丙烯酸与作为光引发剂的〇. 〇4pph Omnirad混合来制备。  foam liquid precursor, hereinafter referred to as the LPF, square photoinitiator agent by 90 wt% 2-EHA in a glass container and 10 wt% acrylic acid with a. 〇4pph Omnirad prepared by mixing. 在引发UV暴露之前，混合物用氮气冲洗10分钟，并在全部时间内都将氮气鼓泡入混合物中直至通过向浆料中加入空气使聚合过程停止。 UV exposure prior to initiation, and the mixture flushed with nitrogen for 10 minutes, and in all bubbling nitrogen into the mixture until the entire time by adding air to the slurry polymerization process is stopped. 混合物始终都使用螺旋桨式搅拌器（300U/min)搅拌，并且反应在粘度达到约2000mPas (当用Brookf ield粘度计测量时，T=25°C，锭子4,12rpm)时停止。 The mixture always using propeller stirrer (300U / min) with stirring, and the reaction was stopped when the viscosity reached about of 2000 mPas (when measured with a viscometer Brookf ield, T = 25 ° C, spindle 4,12rpm). 向浆料中加入0· 16ppH Omnirad BDK、0. 12ppH HDDA交联剂、6ppH玻璃泡K15和6pph Eurocell300-h 并混合直至其溶解/分散。 0 · 16ppH Omnirad BDK was added to the slurry, 0. 12ppH HDDA crosslinker, 6ppH K15 glass bubbles and 6pph Eurocell300-h and mixed until dissolved / dispersed. 如在W02011094385 (A1)中所详述，在实验室涂布机中将液体前体制剂叠加在彼此上。  As detailed in W02011094385 (A1), in a laboratory coater liquid precursor formulation will be superimposed on each other. 第一刮刀的刮刀高度设定为130-140 μπι(对于第一压敏粘合剂层而言)，并且第二刮刀的刮刀高度设定为1240-1250 μπι (对于相对层(泡沫）而言)，两个平面均从基底表面计算。 A first scraper blade height is set to 130-140 μπι (for the first pressure sensitive adhesive layer), and a second scraper blade height is set to 1240-1250 μπι (relative layer (foam) in terms of ), both planes calculated from the substrate surface. 将实验室涂布机连接至可实现不同UV强度的区域的3m长的UV固化工位上。  The laboratory coating machine connected to the region may be implemented on different UV intensity 3m long UV curing station. UV-辐射使带材从其顶部和底部两侧均固化。 UV- radiation from the strip at the top and bottom sides are cured. 从而在所有区域中，将顶部和底部侧的强度设定为相等水平。 In all such areas, the strength of the top and bottom side is set to be equal to the horizontal. 在表1中列出了总辐射强度(顶部+底部）和不同区域的长度。 In Table 1 lists the total radiation intensity (top + bottom) and the length of the different regions. 在20分钟和72小时的保压时间下，以300mm/min来测试机动车清漆涂层UreGloss、Cerami Clear5和VW2K的90。  at 20 minute and 72 hour dwell time, at 300mm / min tested automotive clear coating UreGloss, Cerami Clear5 VW2K and 90. -剥离测量。 - peel measurement. 在24小时的保压时间下，在70°C 下用500g挂码测试对于UreGloss的静态剪切测量，并在90°C下用500g挂码测试VW2K的静态剪切测量。 In the dwell time of 24 hours, at 70 ° C for hanging code testing for static shear measurements UreGloss 500g and measuring the static shear hang test code VW2K with 500g at 90 ° C. 所得结果示出在下表1和2中。 The obtained results are shown in Tables 1 and 2 below. 所有双层PSA膜均使用如W02011094385 (A1)中所述的方法制备，其中总体厚度为1200 μπι。 All films were prepared using PSA double of the method as in W02011094385 (A1), wherein the total thickness of 1200 μπι. 下表2示出了在20分钟的保压时间后，多层PSA膜的90° -剥离值，多层PSA膜在其第一压敏粘合剂层(表层)配方中是非增粘的或增粘的(用Regalite P-1125)并使用不同的低Tg丙稀酸酯。  Table 2 shows the dwell time of 20 minutes, 90 ° multilayer PSA film - the release value, the multilayer PSA film non-increasing in its first pressure-sensitive adhesive layer (surface layer) Formulation tacky or tackified (with Regalite P-1125) and use different low Tg acrylic esters. 多层PSA膜的相对层填充有Eurocell300_h/glassbubbles K15。 Filling the multilayer PSA film layer opposite Eurocell300_h / glassbubbles K15. 表2:20分钟保压时间后的90° -剥尚值。  Table 90 ° 2:20 minutes after the dwell time - still peel value. 这些结果示出，在20分钟的保压时间之后，即使不添加增粘剂（Regal ite P-1125)，包含丙烯酸C17酯的第一压敏层(表层)也示出非常高的剥离粘附性。  These results show that, after 20 minutes dwell time, even without a tackifier (Regal ite P-1125), comprising a first layer of pressure-sensitive acrylic ester C17 (surface layer) are also shown very high peel adhesion. 特别是对于CeramiClear5清漆涂层，所述值示出非常高的剥离性能。 CeramiClear5 especially for clearcoats, the values ​​shown in a very high release properties. 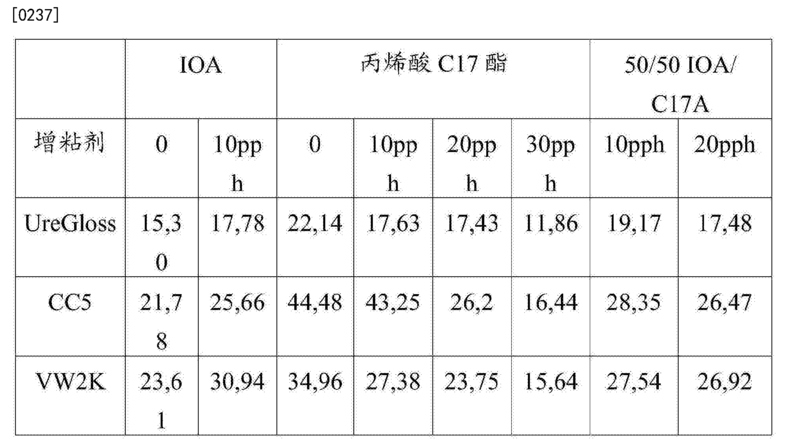 下表3示出在72h的保压时间后的结果。 3 shows the results after 72h dwell time of  the following table. 轰l:72h保压时间后的90° -剥离值。  H l: 72h 90 ° after the dwell time - release values. 对于所有膜而言，在24小时的保压时间后，静态剪切值的结果均给出超过10000+ 分钟的时间。  For all the films, after 24 hours dwell time, the value of static shear results are given over 10,000+ minutes. 表3揭示了对于包含Ι0Α的第一压敏层而言，添加增粘剂改善了对所有三种清漆涂层表面的粘合性能。  Table 3 reveals for the first pressure-sensitive layer comprises Ι0Α of tackifier improves the adhesive properties of all three kinds of clearcoat surface. 参见低Tg丙烯酸C17-酯，可观察到，当与IOA相比时，非增粘型式可实现甚至更好的性能。 See C17- low Tg acrylate ester, can be observed, when compared to IOAs, non-tackifying forms can achieve an even better performance. 通过使用增粘剂，对于Cerami Clear5和UreGloss，剥离值将变得相同，但是倾向于产生粘滞剥离行为，即不均匀的脉冲式粘合断裂。 By using a thickener, for Cerami Clear5 and UREGLOSS, peel values ​​will become the same, but the release behavior tends to produce a viscous, cohesive fracture pulsed i.e. uneven. 对于VW2K清漆涂层基底，当在第一压敏粘合剂层中使用20pph增粘合剂时，剥离值下降。 For VW2K varnish coated substrate, when the first pressure-sensitive adhesive increases 20pph adhesive layer, the peel value drops. 如果在第一压敏层中使用I0A和C17A的经增粘混合物，则特别是对于UreGloss而言，剥离值从粘滞剥离向平滑剥尚移动。 If I0A and C17A in the first pressure-sensitive layer tackified mixture, particularly for UreGloss is, the peel value from the viscous yet moved to the smoothing peeling peeling. 在下表4中，示出了双层PSA膜的结果，其在第一压敏粘合剂层中具有不同的低Tg 单体并且不使用任何增粘剂。  Table 4 below shows the results of bilayer PSA film having different low Tg monomer in the first pressure-sensitive adhesive layer and does not use any tackifier. 在表5中，展示了相同的PSA膜结构，其中在第一压敏粘合剂层中具有附加的lOpph Regalite R-1125。 In Table 5, it shows the same PSA film structure, having additional lOpph Regalite R-1125 in the first pressure-sensitive adhesive layer. 麦i:在72小时保压时间后，多层PSA膜的90° -剥离值，所述多层PSA膜具有在第一压敏粘合剂层中的不同低Tg单体（Ι0Α，C17)。  Wheat i: after 72 hours dwell time, 90 ° multilayer PSA film - the release value, the multilayer PSA film at a first pressure sensitive adhesive layer having a different low Tg monomer (Ι0Α , C17). 轰^:72小时的保压时间后，多层PSA膜的90° -剥离值，所述多层PSA膜具有在第一压敏层中的不同的低Tg单体（Ι0Α，C17)和附加的lOpph增粘剂Regalite R-1125。  H ^: after 72 hours dwell time, 90 ° multilayer PSA film - the release value, the multilayer film has a first pressure-sensitive PSA layer different low Tg monomer (Ι0Α, C17 ) and an additional tackifier lOpph Regalite R-1125. 该比较展示出第一压敏层中的低Tg单体C17A具有对多层PSA膜的最终的粘附强度性能的高度影响。  The low Tg monomer exhibit C17A comparing a first pressure-sensitive layer has a high impact on the final strength properties of the multilayer PSA adhesive film. 与Ι0Α相比，丙烯酸C17酯制剂示出甚至更高的剥离性能。 Compared with Ι0Α, C17 acrylate ester formulations shown even higher release properties. C17A制剂甚至允许第一压敏粘合剂层的不含增粘剂的制剂，这些制剂在LSE基底上实现与经增粘体系相似的剥离性能。 C17A formulation even allows the first pressure sensitive adhesive layer containing no tackifier formulation, these preparations to achieve a similar system tackified with release properties on LSE substrates. 1. 一种多层压敏粘合剂（PSA)膜，其具有第一压敏粘合剂层和至少一个相对层，其特征在于所述第一压敏粘合剂层包含具有基于（甲基）丙烯酸的弹性体材料的压敏粘合剂组合物，所述弹性体材料包含可聚合材料的反应产物，所述可聚合材料包含： (a) 第一单体，其为伯醇f-OH的（甲基）丙烯酸烷基酯，所述（甲基）丙烯酸烷基酯具有式⑴： CH2=C(R2) - (CO)-OR1 (I) 其中R1为具有14至25个碳原子的烷基，并且伯醇R^ΟΗ具有等于至少2但不大于4的iso指数； R2为氢或甲基；和(b) 第二单体，其具有烯键式不饱和基团； 其中所述至少一个相对层包含至少一种填充材料。 A multilayer pressure-sensitive adhesive (PSA) film, having a first pressure sensitive adhesive layer and at least one opposing layer, wherein the first pressure sensitive adhesive layer comprising a basis (A the pressure-sensitive adhesive composition containing an elastomer material yl) acrylic acid, the elastomeric material comprising the reaction product of a polymerizable material, a polymerizable material comprising: (a) a first monomer, which is a primary alcohol f- OH, (meth) acrylic acid alkyl ester, the (meth) acrylic acid alkyl ester having the formula ⑴: CH2 = C (R2) - (CO) -OR1 (I) wherein R1 is having from 14 to 25 carbon atoms alkyl group, and R ^ ΟΗ primary alcohols having at least 2 but not more than equal to the iso index 4; wherein; R2 is hydrogen or methyl; and (b) a second monomer having an ethylenically unsaturated group relative to said at least one layer comprises at least one filler material. 2. 根据权利要求1所述的多层PSA膜，其特征在于所述填充材料选自填料颗粒、微球、 玻璃珠、疏水性二氧化硅型填料、亲水性二氧化硅型填料、纤维、导电和/或导热颗粒、纳米颗粒、以及它们的任何组合或混合物。 The multilayer PSA film according to claim 1, wherein said filler material is selected from filler particles, microspheres, glass beads, hydrophobic silica-type fillers, hydrophilic silica type fillers, fibers , electrically and / or thermally conductive particles, nanoparticles, and any combinations or mixtures thereof. 3. 根据权利要求1所述的多层PSA膜，其特征在于每个R1具有17至21个碳原子。 PSA 3. The multilayer film according to claim 1, wherein each of R1 having 17 to 21 carbon atoms. 4. 根据权利要求1所述的多层PSA膜，其特征在于每个R1具有17个碳原子。 4. The multilayer PSA film according to claim 1, wherein each of R1 having 17 carbon atoms. 5. 根据权利要求1-4中任一项所述的多层PSA膜，其特征在于所述第二单体选自不为式⑴的非极性（甲基）丙烯酸酯、不具有（甲基）丙烯酰基的非极性乙烯基单体、极性单体、交联剂、以及它们的任何组合或混合物。 The multilayer PSA film as claimed in any one of the preceding claims, wherein the second monomer is selected from the formula does not ⑴ non-polar (meth) acrylate not having (A yl) acryloyl non-polar vinyl monomers, polar monomers, crosslinking agents, and any combination or mixtures thereof. 6. 根据权利要求1-4中任一项所述的多层PSA膜，其特征在于以可聚合材料的总重量计，所述可聚合材料包含50至99. 5重量％的所述式（I)的（甲基）丙烯酸烷基酯和0.5 至50重量％的所述第二单体。 The multilayer PSA film as claimed in any one of the preceding claims, wherein based on the total weight of the polymerizable material, a polymerizable material containing the Formula 50 to 99.5% by weight of ( I), (meth) acrylic acid alkyl ester and 0.5 to 50% by weight of the second monomer. 7. 根据权利要求1-4中任一项所述的多层PSA膜，其特征在于所述相对层为第二压敏粘合剂层。 The multilayer PSA film as claimed in any one of the preceding claims, characterized in that the second opposing layer is a pressure sensitive adhesive layer. 8. 根据权利要求7所述的多层PSA膜，其特征在于所述多层膜包含介于所述第一压敏粘合剂层和所述第二压敏粘合剂层之间的至少一个中间层。 At least 8. The multilayer PSA film of claim 7, wherein the multilayer film comprises a pressure sensitive adhesive interposed between the first layer and the second pressure-sensitive adhesive layer an intermediate layer. 9. 根据权利要求1-4中任一项所述的多层PSA膜，其特征在于所述相对层和/或所述中间层包含聚合物基体材料，所述聚合物基体材料选自由以下组成的组：聚丙烯酸酯、聚氨酯、聚烯烃、聚苯乙稀、天然橡胶、合成橡胶、聚乙烯吡咯烷酮、以及它们的任何组合或混合物。 9. The multilayer PSA film as claimed in any one of claims, wherein said opposing layers and / or the intermediate layer comprises a polymer matrix material, said polymeric matrix material is selected from the group consisting of group: polyacrylates, polyurethanes, polyolefins, polystyrene, natural rubber, synthetic rubber, polyvinyl pyrrolidone, and any combinations or mixtures thereof. 10. 根据权利要求1-4中任一项所述的多层PSA膜，其特征在于用于形成所述相对层和/或所述中间层的聚合物基体材料的可聚合前体，包含（甲基）丙烯酸2-辛酯，其中所述可聚合前体包含85至99. 5重量％的（甲基）丙烯酸2-辛酯。 10. The multilayer PSA film as claimed in any one of the preceding claims, characterized in that for the opposing layers and / or polymerizable precursor polymer matrix material forming the intermediate layer, comprising ( meth) acrylate, 2-octyl acrylate, wherein said polymeric precursor comprises from 85 to 99.5% by weight of (meth) acrylate, 2-octyl acrylate. 11. 根据权利要求10所述的多层PSA膜，其特征在于所述（甲基）丙烯酸2-辛酯整体衍生自生物材料。 11. The multilayer PSA film according to claim 10, wherein said integral derivative (meth) acrylate, 2-octyl from biological materials. 12. 根据权利要求1-4中任一项所述的多层PSA膜，其特征在于所述第一压敏粘合剂层和/或所述中间层包含至少一种填充材料，所述填充填料包含膨胀珍珠岩。 The multilayer PSA film as claimed in any one of the preceding claims, wherein said first pressure sensitive adhesive layer and / or the intermediate layer comprises at least one filler material, the filler filler comprises expanded perlite. 13. 根据权利要求12所述的多层PSA膜，其特征在于所述膨胀珍珠岩颗粒表现出表面改性。 The multilayer PSA film according to claim 12, wherein said expanded perlite particles exhibit a surface modification. 14. 一种制造根据权利要求1-4中任一项所述的多层压敏粘合剂膜的方法，从而使所述第一压敏粘合剂层和所述相对层叠加在彼此上。 14. A method according to claim manufacturing a multilayer pressure sensitive adhesive film of claims 1-4, such that the first layer and the pressure-sensitive adhesive layer over one another relative . 15. 根据权利要求1-4中任一项所述的多层压敏粘合剂膜的用途，其作为PSA膜用其第一压敏粘合剂层粘结至基底表面上，所述基底表面选自聚烯烃表面和清漆涂层表面。 15. Use of a multilayer pressure sensitive adhesive film according to any of claims 1 to 4, which is bonded to the upper surface of the substrate with a PSA film having a first pressure sensitive adhesive layer, the substrate surface and a surface selected from polyolefins clearcoat surface.